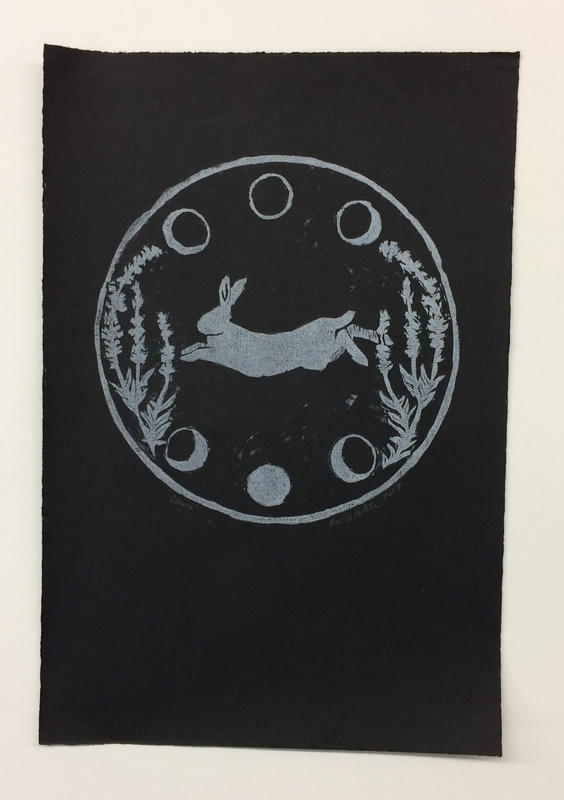 I had the chance to spend the last few weeks of summer at Penland School of Crafts on a work-study scholarship. This was my first time attending Penland and I hope it won’t be my last. It was a truly unique experience and one that forced me to slow down and relax. 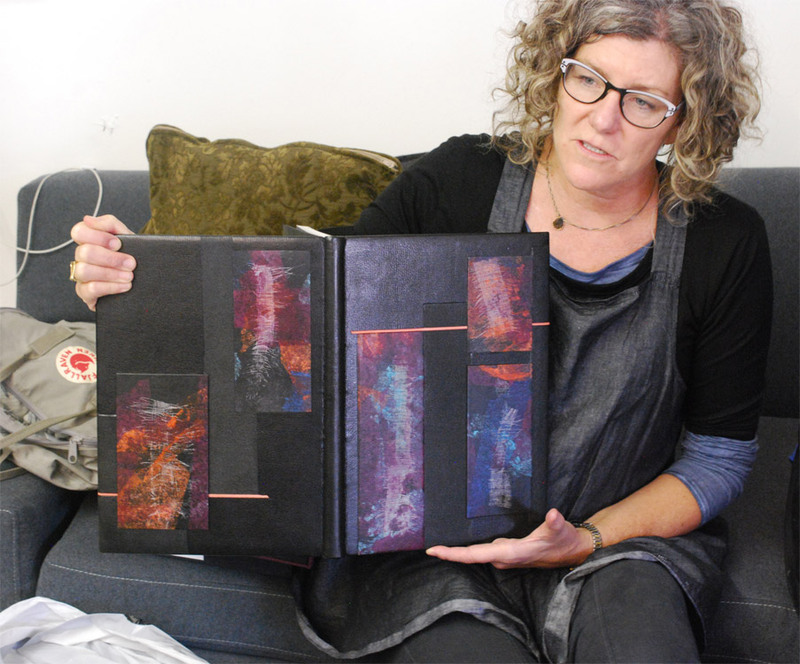 It also gave me the freedom to be expressive in a medium outside of bookbinding. 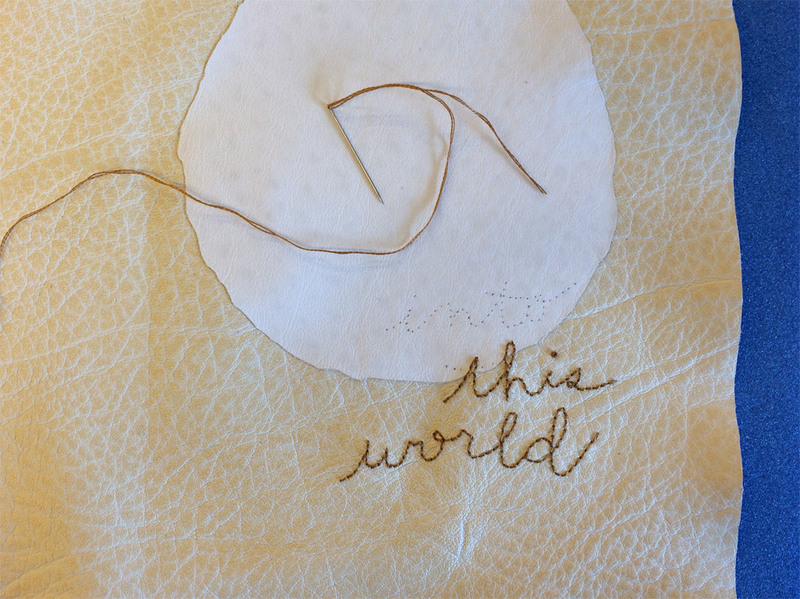 I came to Penland to take Rebecca Ringquist‘s Maximalist Embroidery workshop. Her work has intrigued and inspired me for years. The level of detail and depth she can create through embroidery really drew me in and I wanted to learn more. 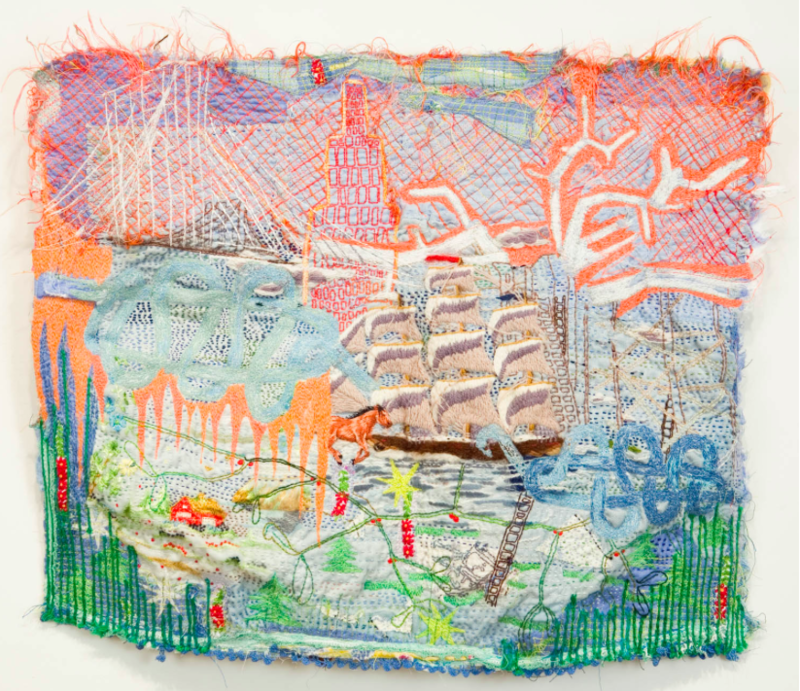 She uses a combination of hand embroidery and “drawing” with the machine. 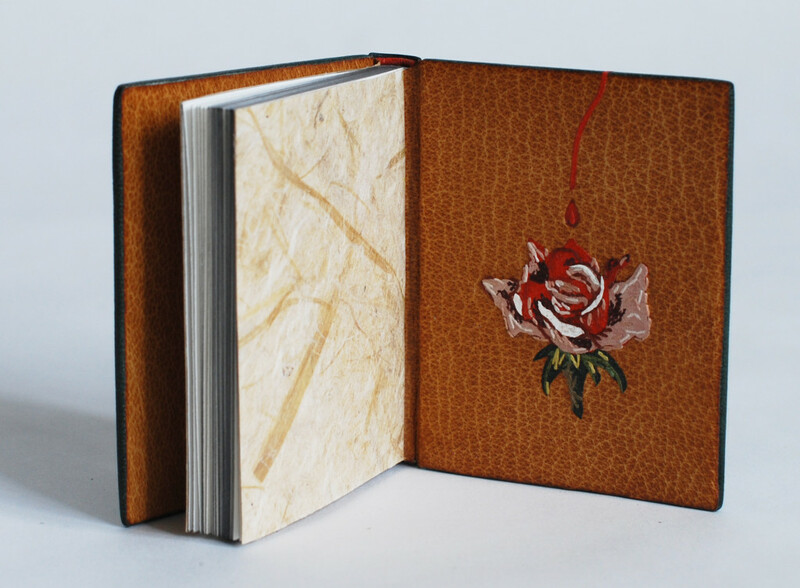 My goal for the taking this workshop was to see if I could incorporate any of the techniques into my binding work particularly with leather. We jumped in right away, not on cloth, but on paper with drawing exercises. 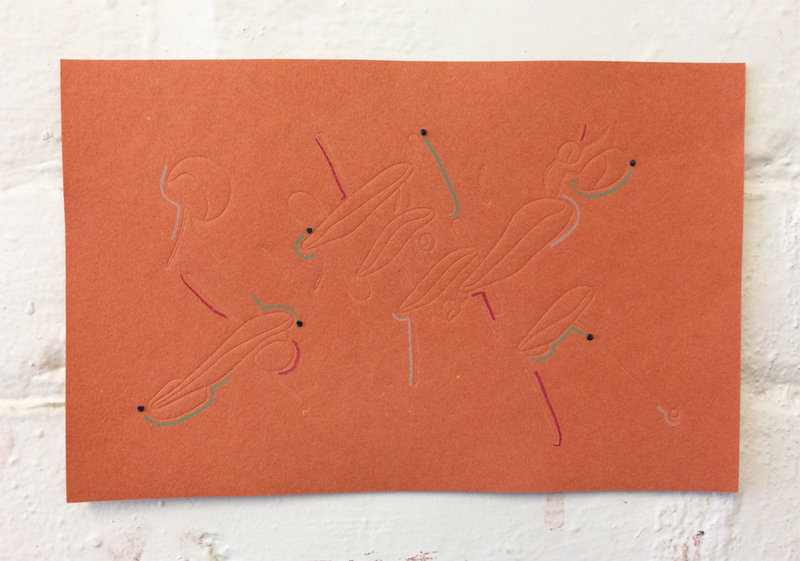 Rebecca is a collector of flash cards and we used the simple imagery as our guide for blind contour drawings. 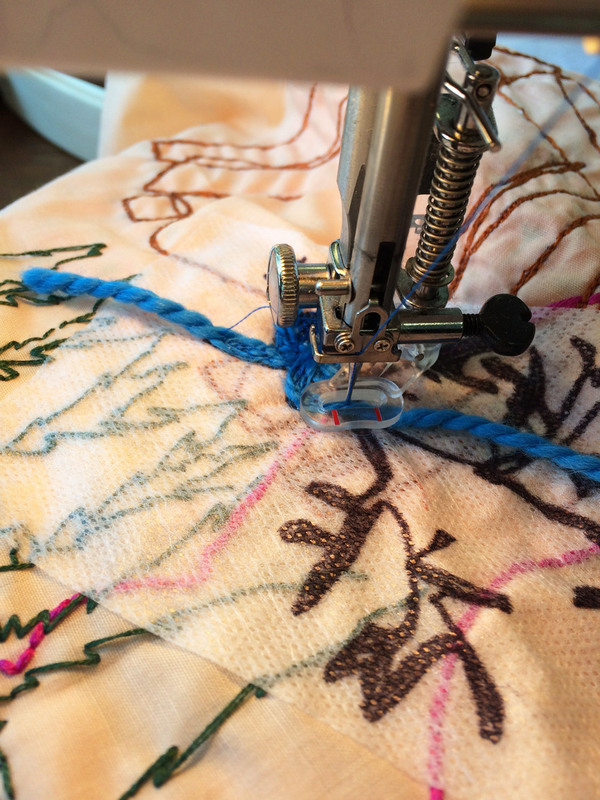 In bursts of 60 – 30 – 15 seconds, we soon had a slew of drawings to inform our embroidery. 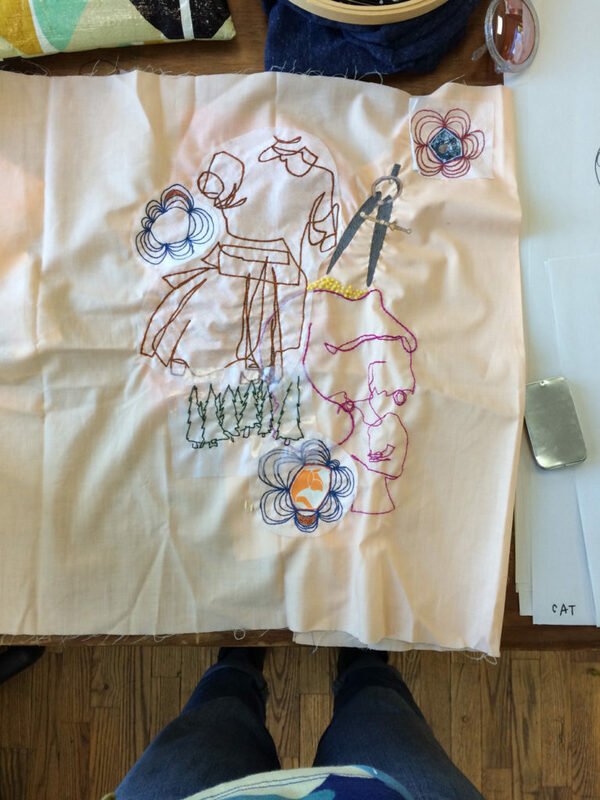 After selecting one our favorite pieces, we then free-handed the drawing onto a piece of cloth. We were limited to one hour and could use any stitch we wanted. 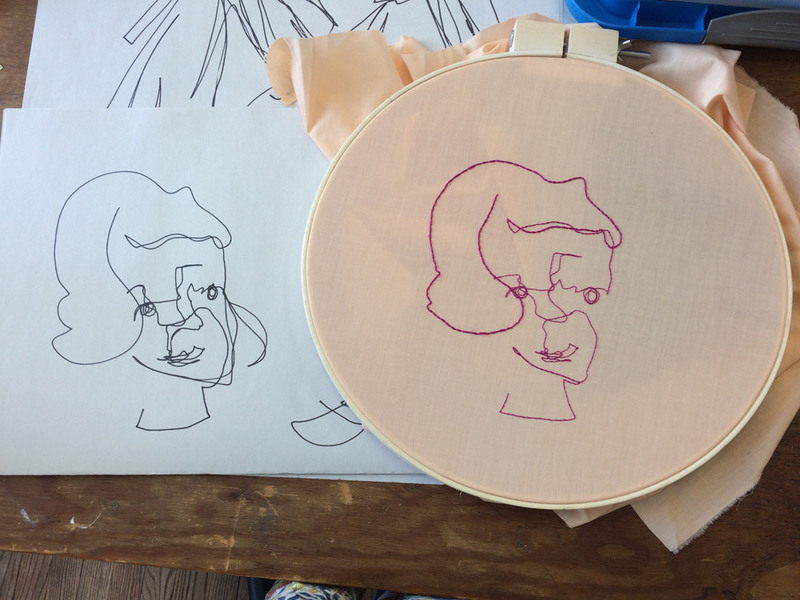 I recreated a drawing of GIRL using bright pink thread on a peach cotton cloth. 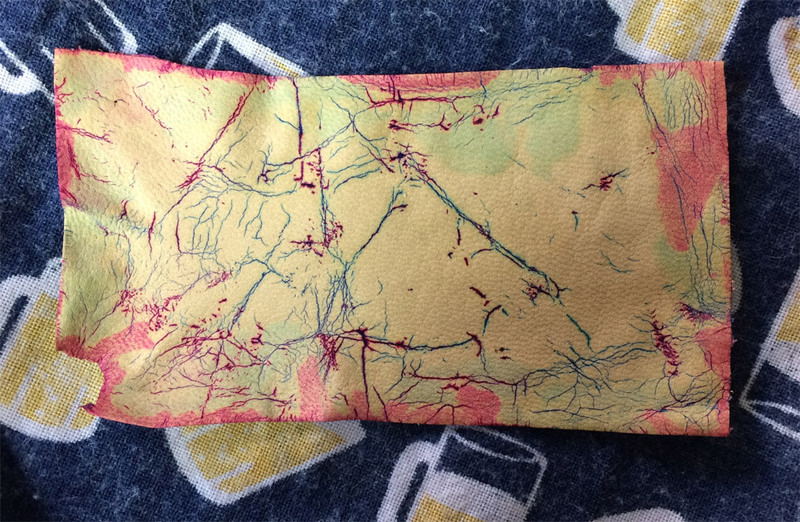 I used back stitch in various thread thicknesses. We continued to use our contour drawings with other techniques for transferring. After finishing GIRL, I transferred my image of DRESS onto Sulky Solvy (a starch-based product with a sticky backing that dissolves in water). 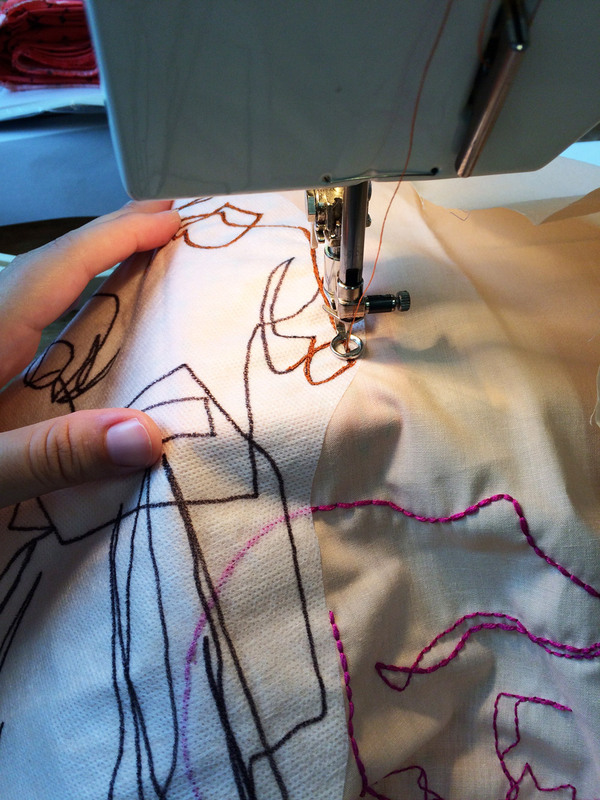 This time I used the sewing machine to “draw” my image onto the fabric. Using these two techniques I began to build on my design. Adding machine-sewn flowers with reverse appliqué centers and hand stitched trees that were drawn by a fellow classmate. The yellow dots are just the start of a field of french knots and the dividers were created on the machine. As the week progressed so did my piece, I continued to layer with more drawings, found embroidered pieces, dense machine stitching, appliqué and trimmings. I also got into machine couching, which offers a faster alternative to hand couching and a different effect. The way I chose to execute this technique was with the use of the Sulky Solvy. I placed my design and used a royal blue thread to couch a royal blue scrap of yarn by stitching mainly through the center. Throughout the week, we held three small critiques to voice our compliments and suggestions. It was refreshing to be back in a setting where we could freely discuss our ambitions and struggles. And it was wonderful to see how my classmates incorporated this feedback and battled through their own fears with destruction, layering and creation. At the end of the week, I created a nearly finished piece. I’ve taken to Rebecca’s strategy and stowed it away for now to be reviewed later. Rebecca informed us that she will continue to work on a piece over several months or even years, keeping it in a drawer and out of sight from time to time. The following images showcase my final piece and some work from my classmates. As I mentioned before, I was able to attend with the aid of a work-study scholarship. This meant that I had to arrive and work a day before and after my week-long workshop. I ended up with washing duties in the kitchen during my week shifts. It was hard to pull myself away from the studio at times to go wash pots, but this community action is part of the foundation of the school and how it continues to thrive. 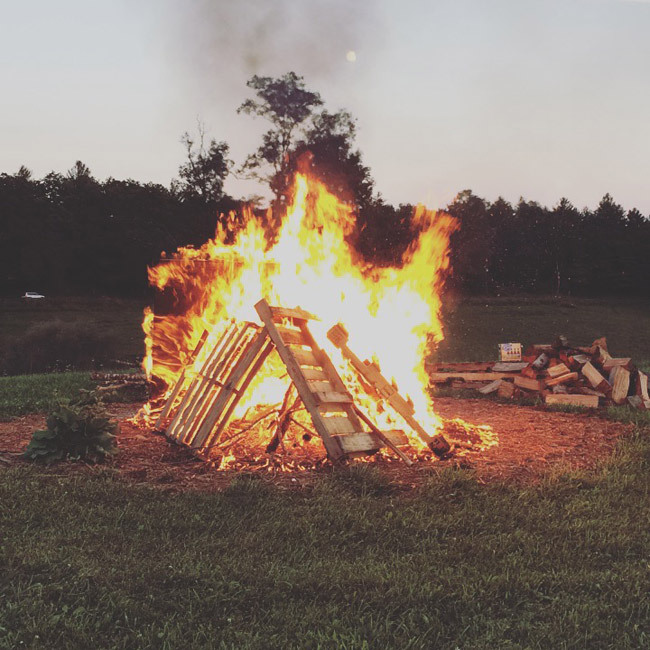 Since I was able to stay a few days beyond my duties, I got to participate in the end of the season bonfire with some of my fellow work-study mates, the staff and fellows at Penland, plus the community that lives around campus. It was the perfect send off. 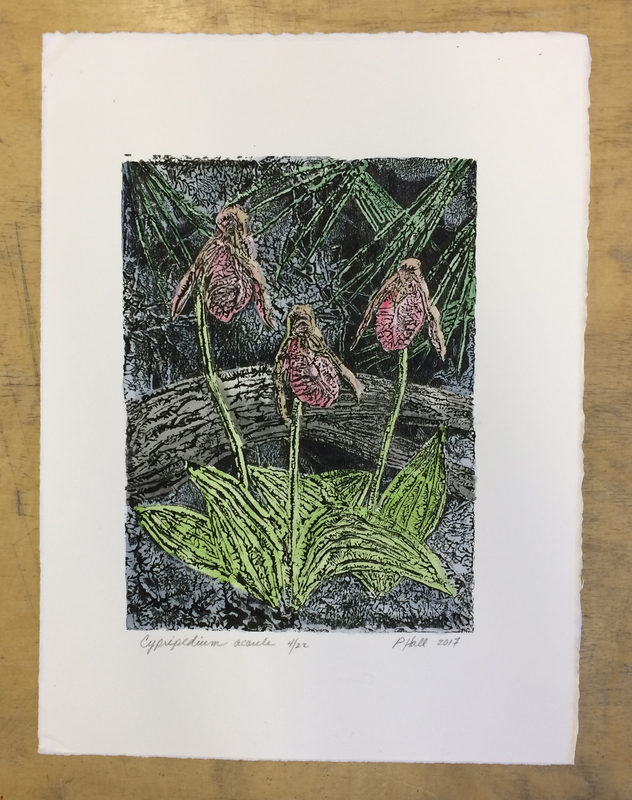 I recently participated in a print exchange with a few fellow members of the New England Chapter of the Guild of Book Workers. 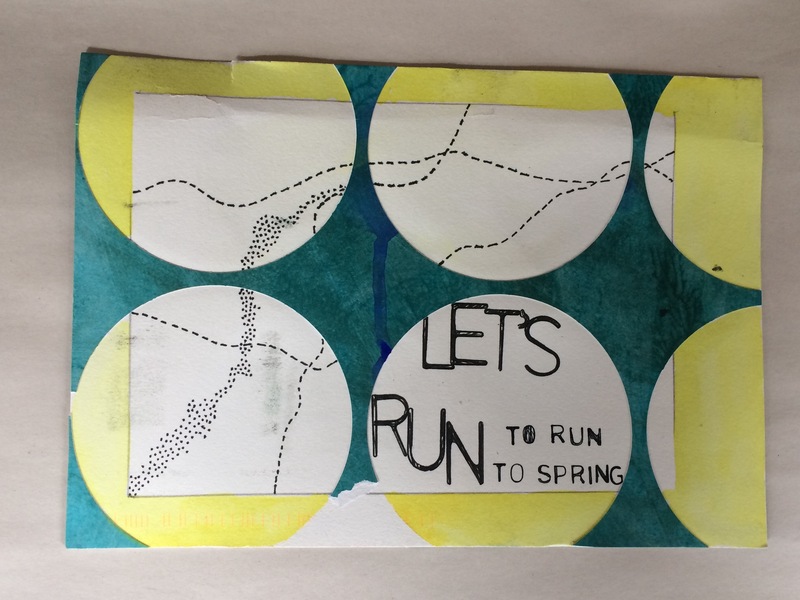 Our instructions were to create a print edition using any medium we desired around the optional theme of Spring. The prints were then sent through the mail to each other. So in the end I made 11 prints (plus a few extras) and received 11 different prints from everyone else. 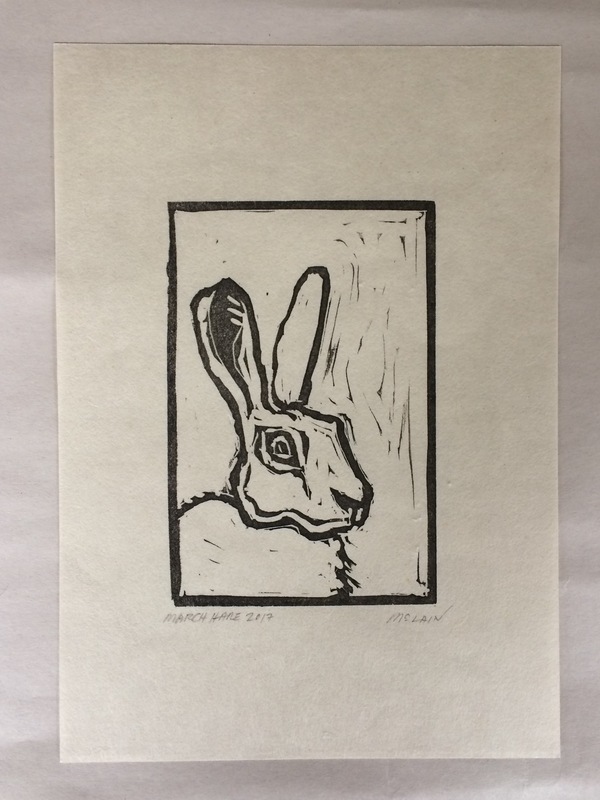 The print I created was part collaboration with my husband. 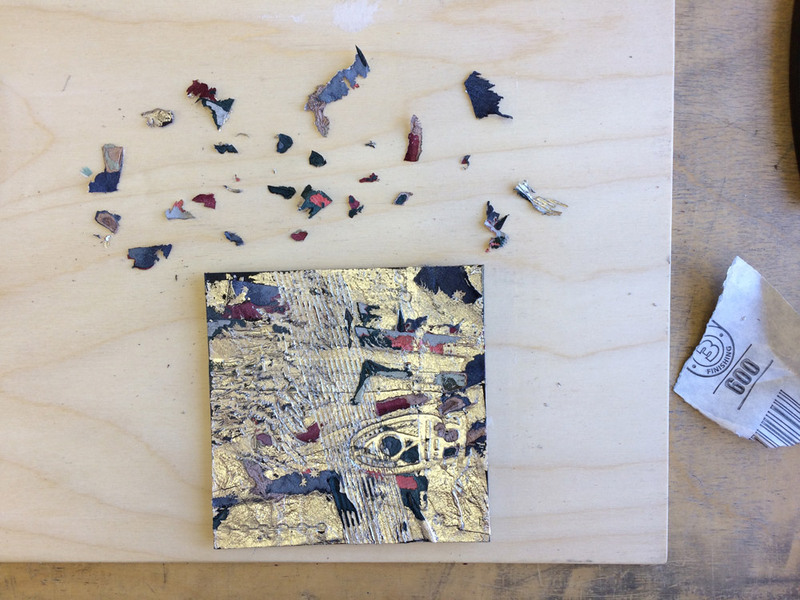 He drew an image that I had turned into a metal die, which was heated and pressed into paper. 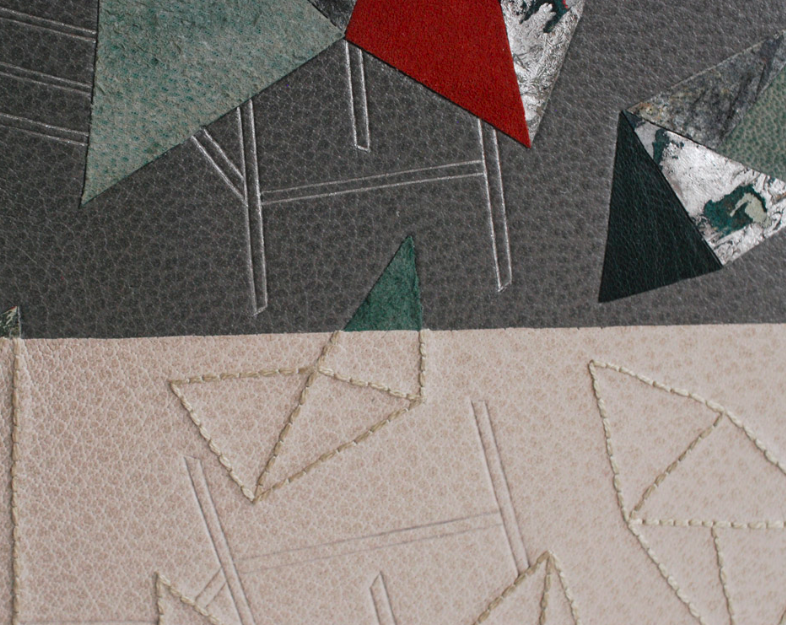 I chose two papers handmade by Katie MacGregor, orange and a sort of dull algae green. Once the impression was made, I then drew several marks with colored pencils. The dots are hand-stitched french knots. At the beginning of November, I spent two and a half weeks living under the gloomy, grey skies of London. But having lived in Boston for the past six years, I felt quite at home with the overcast days and long train rides. After getting settled in my flat just outside of Tufnell Park, I spent my first day wandering around the Victoria and Albert Museum. An exhibit on Medieval English embroidery occupied most of my time during the visit. The exhibit surveyed religious garments and coverings dating from the 13th – 15th centuries. The quality of the stitchwort was breathtakingly beautiful and in such immaculate condition for their age. After my jaunt at the V&A (plus a quick bite at the cafe), I wandered around Soho, popping into a few shops before ending up at Mother Mash for dinner (so delicious and highly recommended). But let me get to the real reason why you are reading this post. The next day I traveled from my flat in Tufnell Park to Barnes for the first of nine days with Mark Cockram. I arrived promptly at 10:00 in the morning, not a minute too early or too late (as were the rules). On the first day, we focused on paring with a Schärffix (which I did standing up, a bit unusual for me) and using a French paring knife. All of the pared leather was used to create “swiss rolls”, which is a term used by Mark to describe this technique but has also been described by Philip Smith as “maril”. 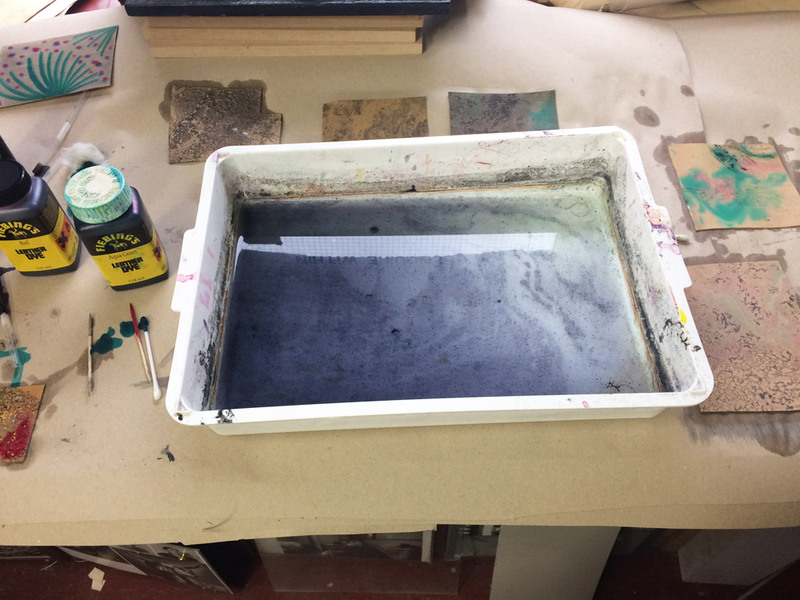 Mark also shared reverse cellulose printing with me, which is the process of transferring a printed image onto leather. On the second day, I continued to play with my creations from the previous day. I took the shavings from the swiss rolls and created an assemblage. I took my printed leather and pared it down in preparation for board attachment using Mark’s method of edge paring. 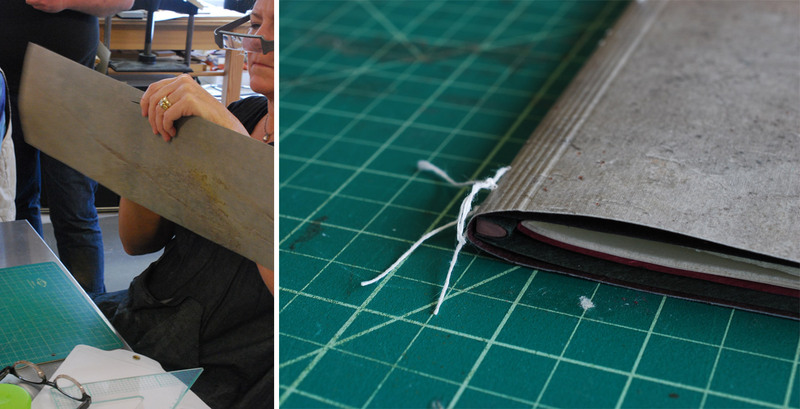 The day’s final demonstration centered on laying down leather corners using a nifty tool called a tensai. 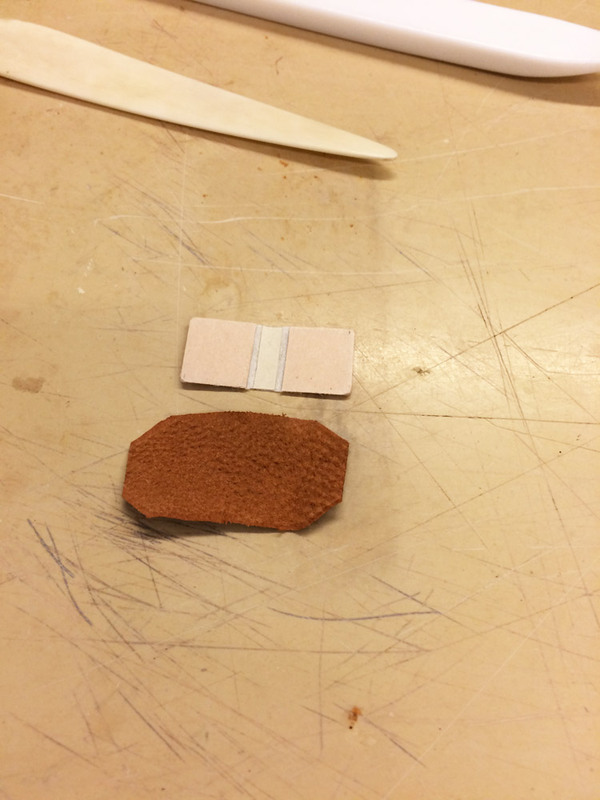 The tensai is shown in the image below on the right and is used to mark the leather before trimming. Its name translates from the Japanese word for genius. And I certainly felt quite like one with this technique for finishing off corners. Today was the beginning of leather dying, starting with the craquelle technique (see more in Day Four). While waiting for the thick layer of paste to dry before the dye could be applied, I began working on a technique that was unnamed at the beginning of the demonstration but was eventually dubbed “dicated surface” (this name was randomly chosen from the dictionary by Mark, but is in fact the second half of a hyphenated word). 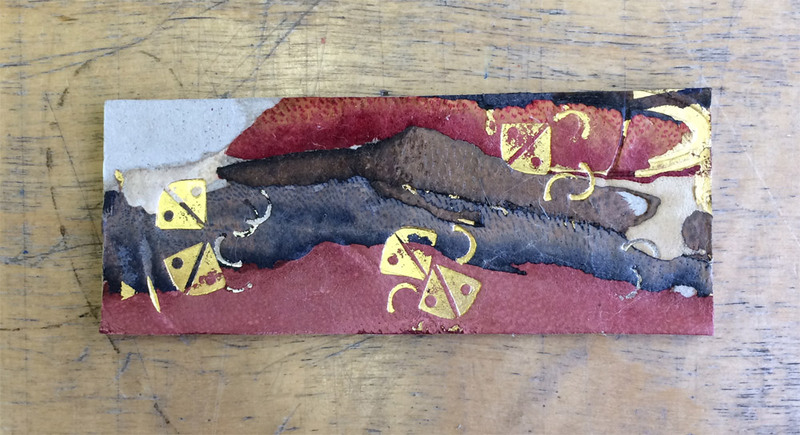 This technique is implemented by creating multiple layers of leather. These layers are then manipulated in a variety of ways to alter the aesthetic and texture of the surface. After feeling satisfied with its look, I distorted the plaquette further by cutting it down into square tiles. By Mark’s encouragement, I continued to play with the aesthetic of the tiles by using embroidery floss to enhance the texture more. I took three of the embroidered tiles and pasted them to a piece of fair goatskin. After back-paring by hand, I continued to tinker with the design by adding additional embroidery around the tiles. I continued to work on this piece throughout my time at Mark’s studio (below is the piece in progress, I have yet to finish it). 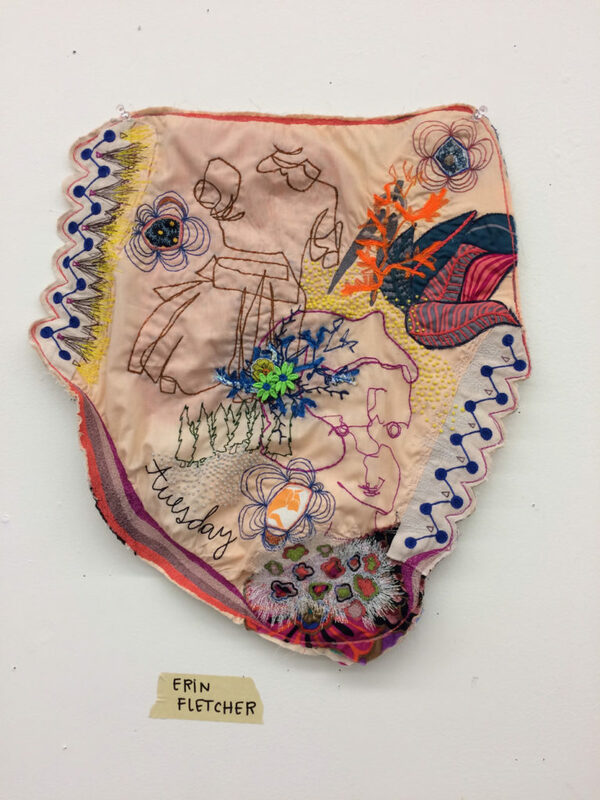 Over the next few days, the focus was primarily on dye techniques with free time to collage multiple techniques onto one plaquette. I was able to finish my craquelle sample piece, which dried on Mark’s lovely tea towel patterned with steins. 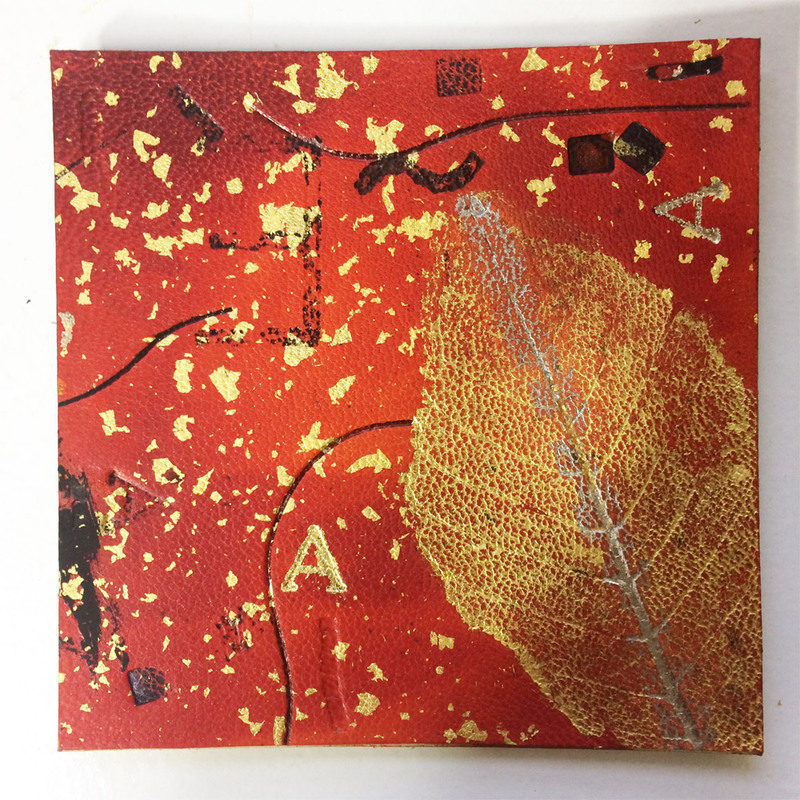 The next sample piece I created was unevenly dabbed with orange leather dye before being pressed with a leaf. The impression created by the leaf was then highlighted with gold leaf and palladium at the midrib (main vein). In the area around the leaf, Mark had me test out Sunago, the Japanese term used to describe sprinkling with leaf. I continued to manipulate the plaquette by employing different types of black line work using carbon paper, acrylic paint, ink and foils. The tool also changed depending on the look I wanted; I used a variety of pens, small brushes, PVA, brass finishing tools and a heat spatula. Even more dye techniques were demonstrated to me on day seven, at this stage the dye was mostly painted on with cotton swabs, toothpicks and brushes. But the most interesting type of dye application was flottage (simply put: marbling). I played around with different colors and ways of dropping the dye into the bath. Below is my personal favorite. One the final days I tooled some of my dyed pieces with brass tools that I made using quick tooling making techniques. You can see the tool in progress in the image below on the left. Mark also had me make a capital letter G, which was quite difficult. If you don’t believe me, then try it yourself. The last two days were focused on tooling the various plaquettes I had. I played around with different applications of size and the order of when I made the impressions. After a few days off, I got on a bus that took me across London to Tracey Rowledge‘s studio just west of Regent’s Park. I spent two days with Tracey, learning her technique for tooling. A unique style she learned from Ivor Robinson. I chose to learn how to employ this technique on paper rather than leather. Below are some of my favorite examples from the collection of pieces Tracey laid out for me to view. 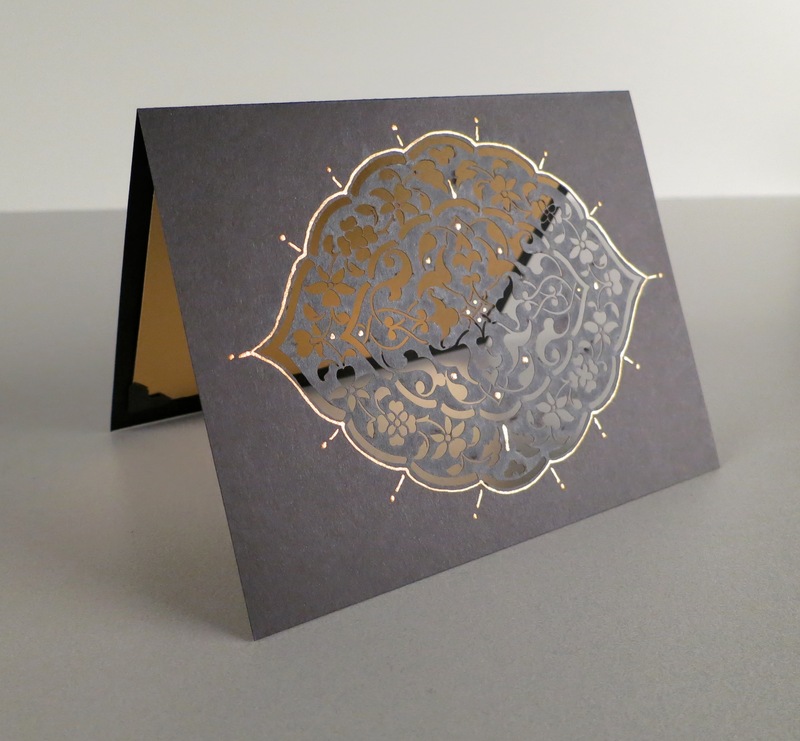 Working with a simple swirl design, Tracey walked me through her process. We discussed laying out a design, choosing the right tools to build up the design (which may require making custom tools) then transferring the design to the plaquette. 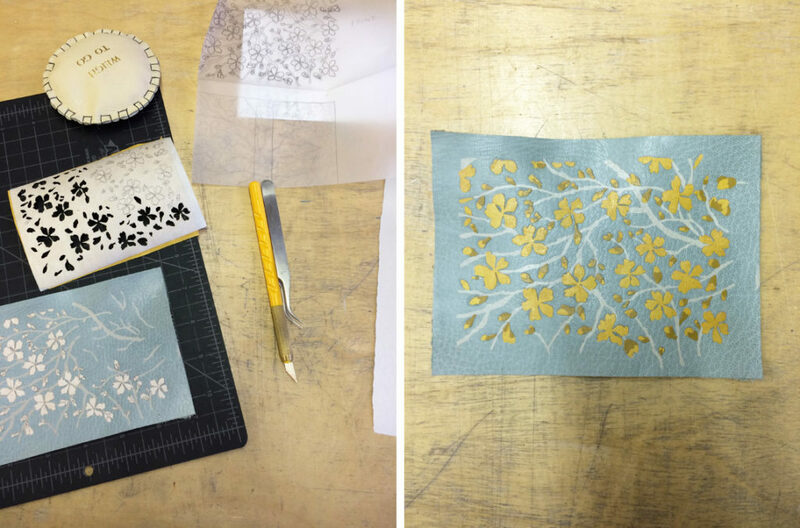 We blind tooled the design through a lightweight handmade paper before painting the impressions with glaire. Tracey pushed me to focus on my posture, making sure I approached the plaquette with accurate precision to place the tool in the right impression. 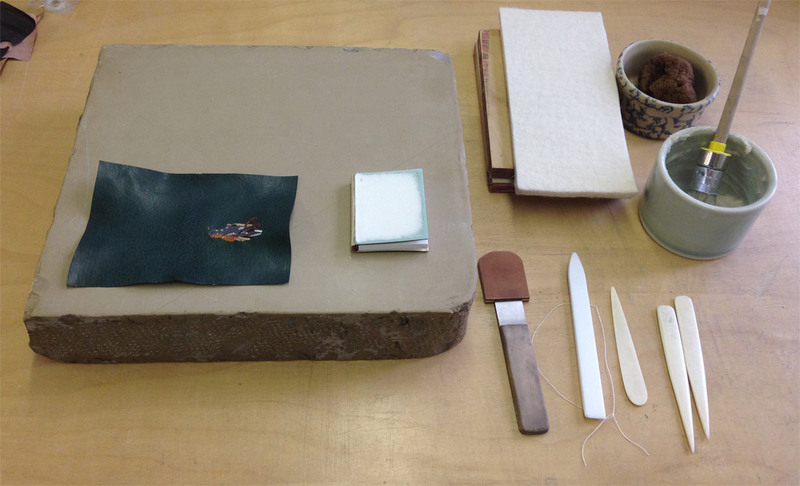 Below is an image of how the bench was set up to streamline the tooling process (at this point the plaquette has been blind tooled and painted with glaire and my leaf of gold has been cut into very small square pieces). I continued to work on this design the entire day, taking snack and water breaks from time to time. On my final day, I continued to perfect my posture and technique under Tracey’s guidance. In addition to the initial plaquette, I also brought a variety of handmade papers from home that I began to play around with by testing direct tooling (seeing how the glaire would alter the appearance of the paper) versus blinding first. We also got into carbon tooling (direct versus blinding first). Here are the selection of papers I brought from home (and one that Tracey gave me). From left to right in the top row: Wheatstraw (black) from Hook Pottery Paper and paper from Katie MacGregor. 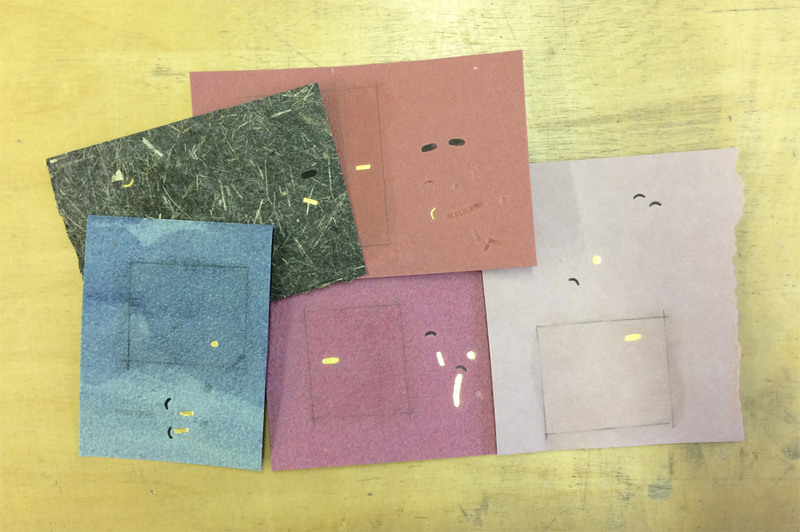 From left to right in the bottom row: Indigo Day Cave Paper, Zaansch Bord (redbrown) from De Schoolmeester and Bugra. My time in London was unforgettable, Mark and Tracey are incredible tutors. There was such a stark contrast to their styles of instruction, but each were able to push and challenge me in a way that enhanced my understanding of these techniques (some familiar and some new). I am so grateful to Mark’s pushback every time I asked a question, he has instilled within me the drive to experiment more and not to play it safe with my designs. But I am also grateful to Tracey’s controlled and thoughtful way of working, she taught me how to feel the motion of tooling within my entire body and to work in a meditative way. I left feeling beholden to Mark and Tracey, I hope for the opportunity to study with them again in the future. 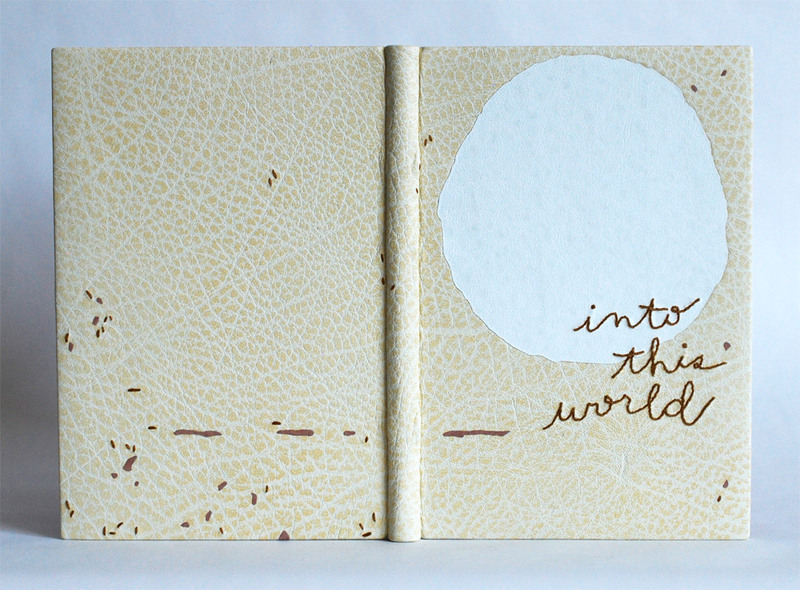 I recently completed a French-style fine binding around Natalie Goldberg’s Into This World. 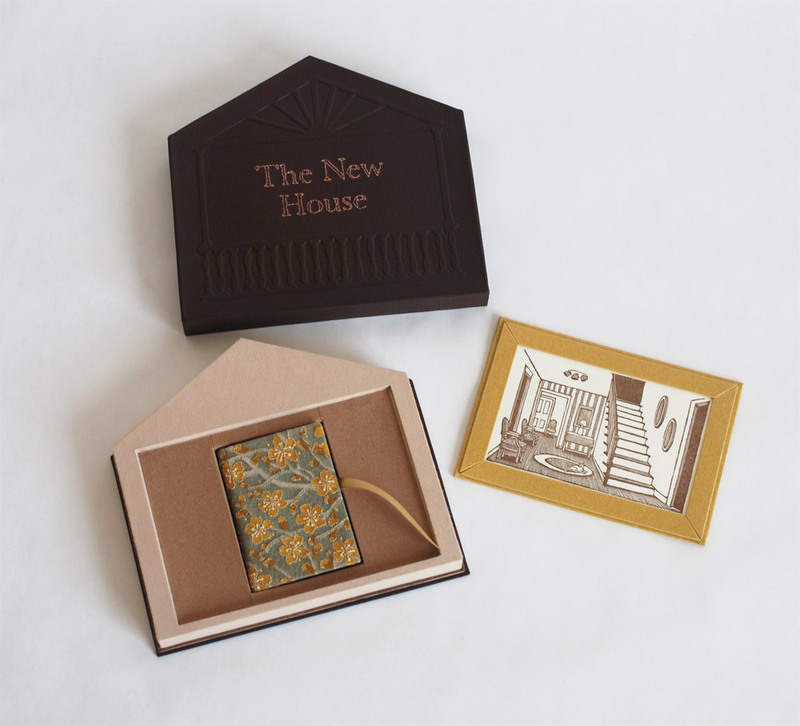 The letterpress printed text is paired with woodblock prints both carved and printed by Clare Dunne and hand-tinted by Sialia Rieke. 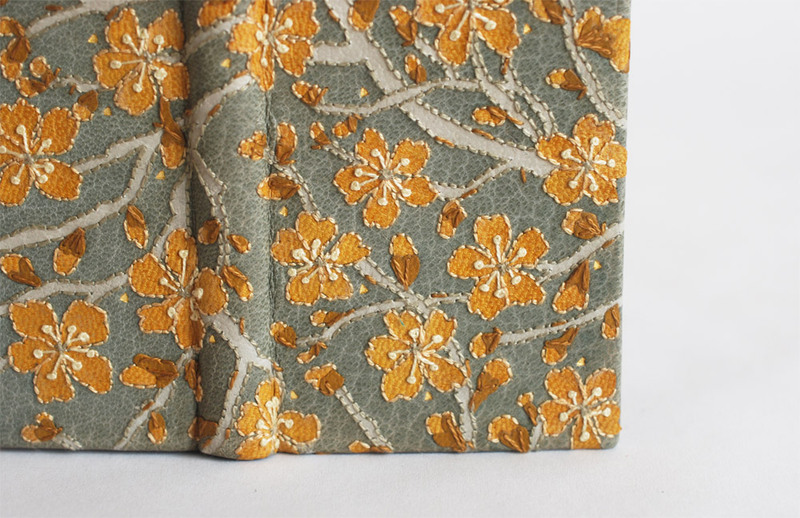 The texture of the prints were my inspiration for the design for the binding. By combining the natural texture of the buffalo skin with embroidery and leather onlays, I hoped to capture the pops and cracks between the layers of color. 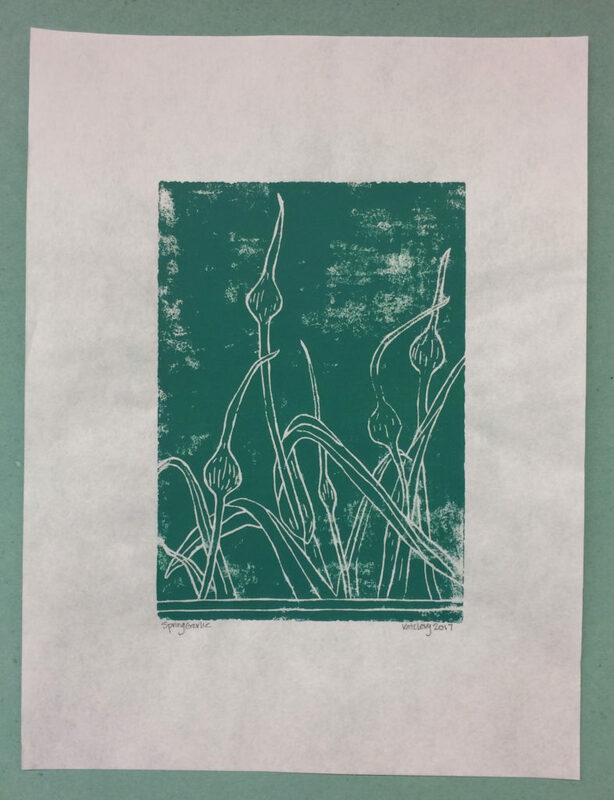 With this plan in mind, I used a single print as my inspiration to lay out the design. 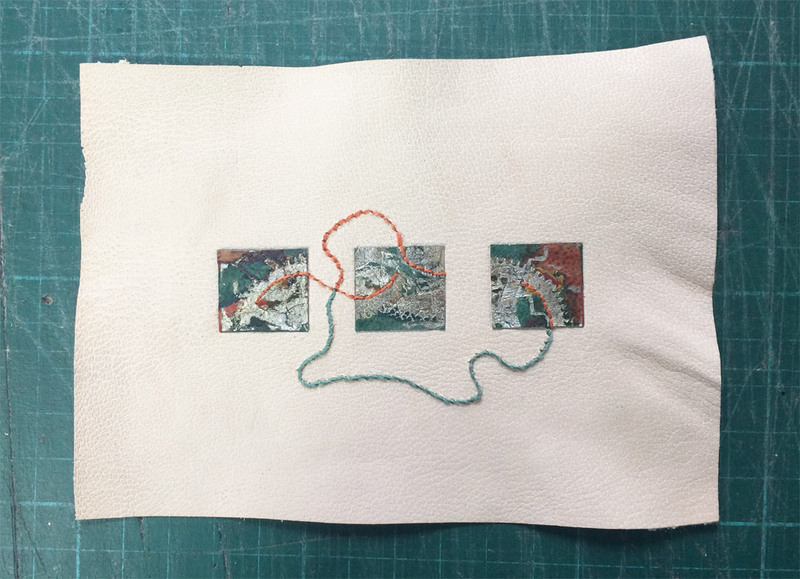 For the embroidered elements of the design, I chose to play with the technique in two new ways: an embroidered title and embroidered paper doublures. The script used for the title mimics the author’s own handwriting taken from her signature on the title page. The title was drawn onto tracing paper and taped in place, overlapping the white buffalo back-pared onlay. I tend to pre-punch the holes for embroidery, especially when I am trying to achieve something exact. 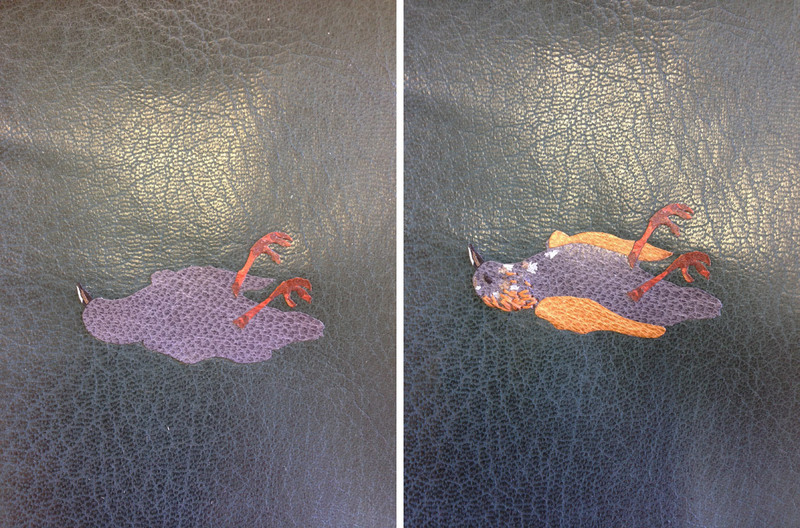 For the pre-punching, I put a thin embroidery needle in my pin vise and placed the leather onto a piece foam. 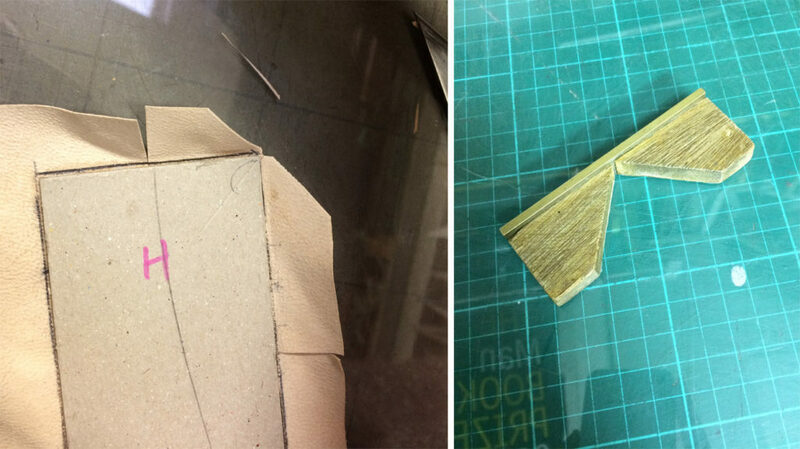 Then I used the tracing paper to guide my pin vise. The embroidery for the title happened in two steps: back-stitch to spell-out the letters with french knots for the i’s dots and then I wrapped the stitches to create a raised, more defined line. 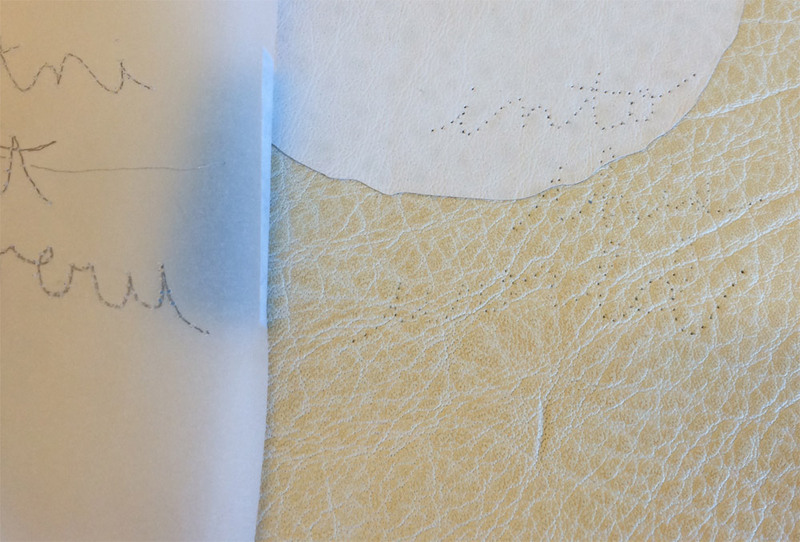 After the title was completed, several seed stitches were scattered around the binding with the majority of them appearing on the back cover. I used the same technique to pre-punch the holes for the seed stitches, this time using the full-scale template. 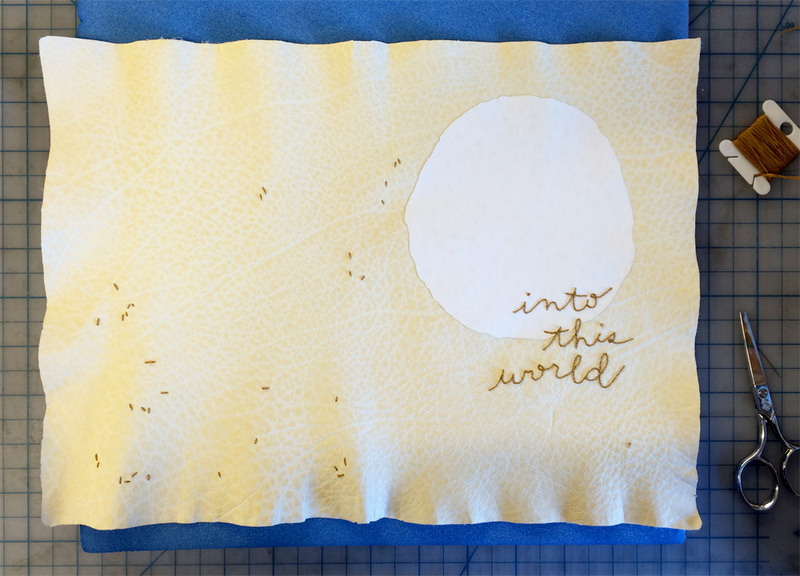 The title and seed stitches were sewn with 2-ply cotton thread in an ochre yellow. 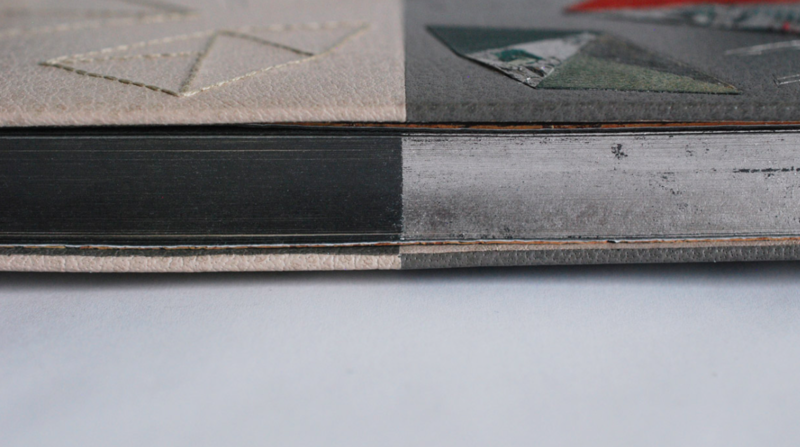 The second embroidered element in the binding are the edge-to-edge paper doublures. 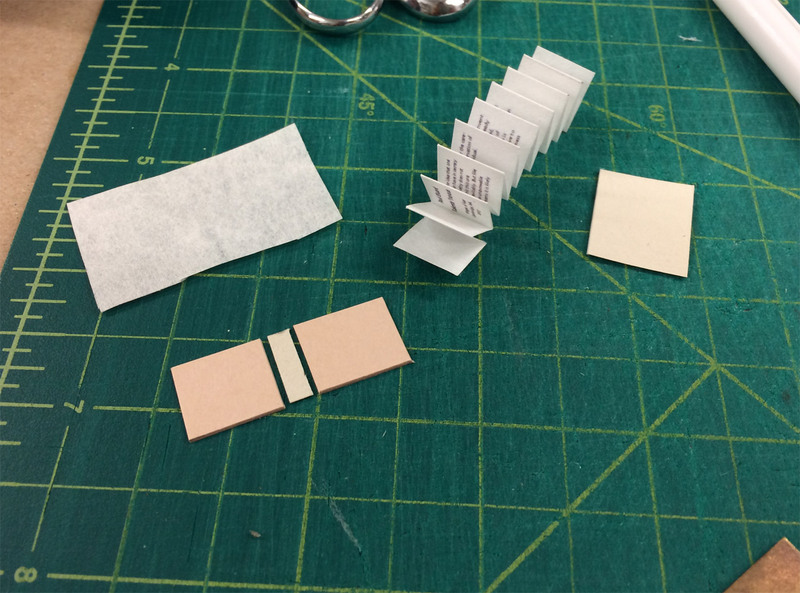 The prep for paper doublures is very similar to the set-up for leather doublures; for paper I allowed a wider turn-in as I trimmed out, this would ensure a smoother surface under the paper. Below you can see the turn-ins post covering and with the leather hinge in place. After scoring a frame around the board and spine edge, I began to trim off the excess leather at a slight bevel. In order to create a successful doublure, several layers are added to the board (one at a time) and sanded to make the board as smooth as possible. The first layer (shown on the right in the image below) was a piece of 10pt. card, first sanded along all four edges and attached with a PVA/methylcellulose mix. After allowing that layer to dry under weight for an entire day, I sanded the edges smooth (which is the state visible in the image below). 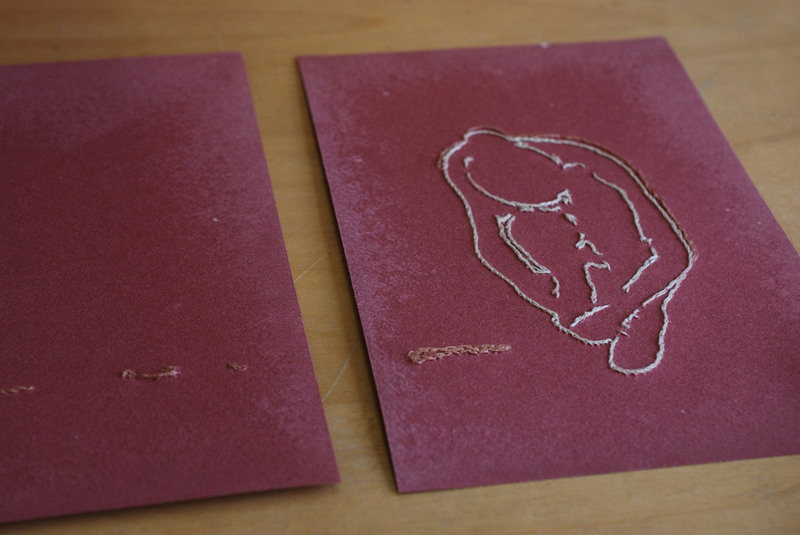 In between these stages, I began working on the embroidered paper doublures. 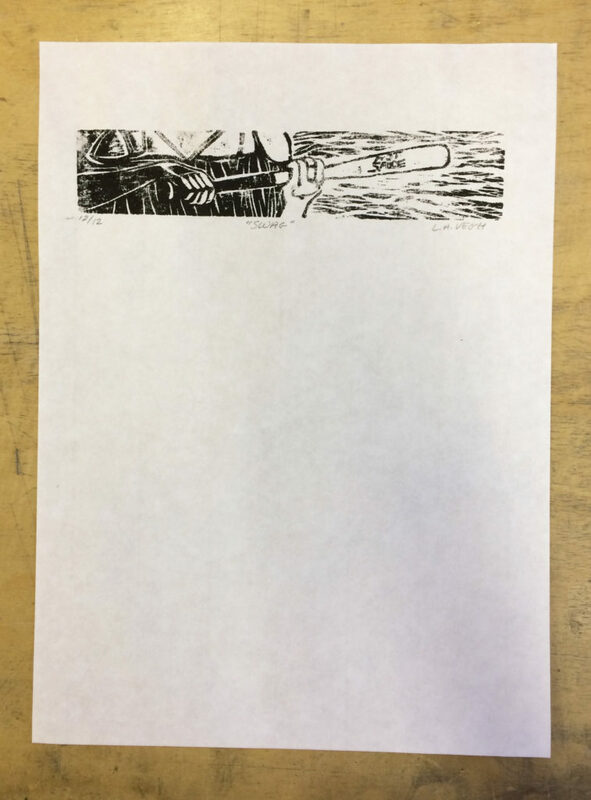 Referencing the same print used to inspired the covers, I traced an outline of the figure from the image. I felt that her pose embodied the sentiments of the text perfectly. Using the tracing paper once again as my guide for punching the holes, I placed the paper onto a piece of foam and poked through the tracing paper into the doublure paper. 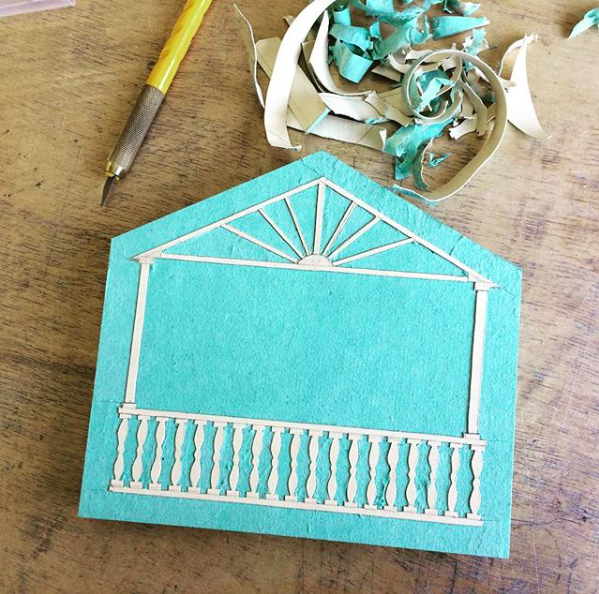 Once the paper pieces were fully embroidered, I carefully sanded the backside of the paper to create a smoother feel along the edges once glued down to the board. Below you can see the board in it’s final stage. After sanding down the 10pt. 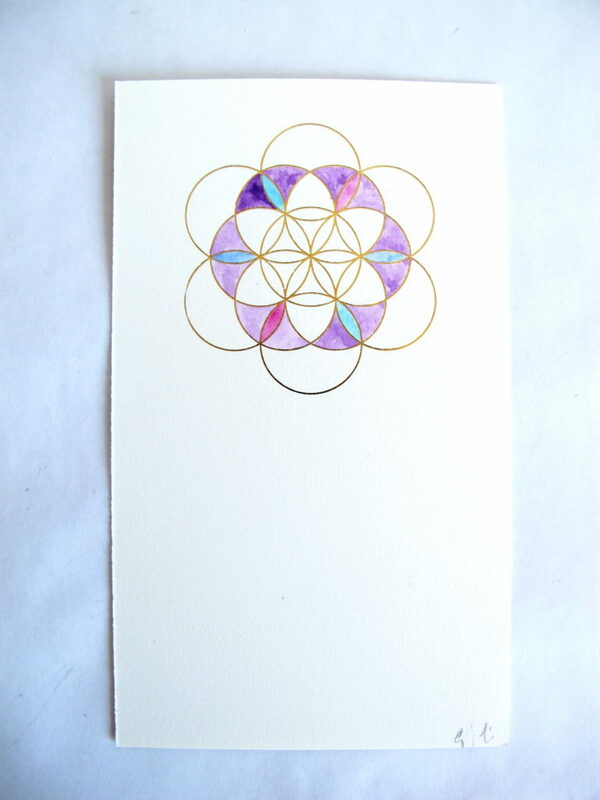 card, I attached a medium weight smooth paper. This piece was slightly oversized on three edges and sanded down on the spine side. After allowing it to dry under weight, I sanded it down smooth. 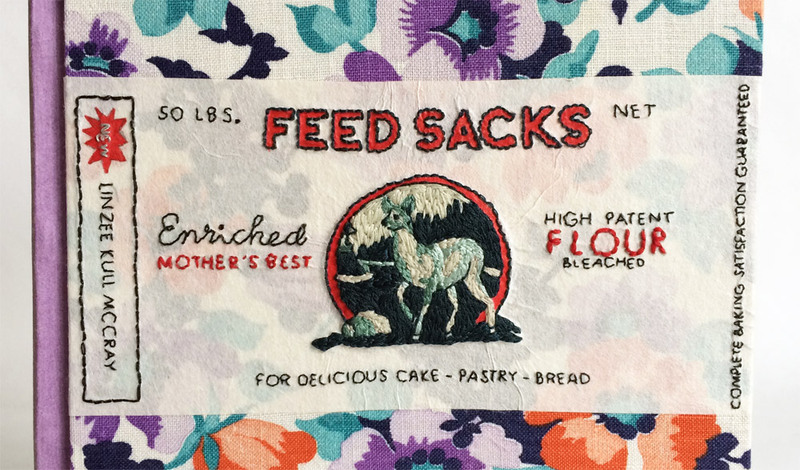 The embroidered paper doublures were attached with MIX and put under weight for a day in order to dry thoroughly and to prevent the board from cupping inward. And here are the final results. 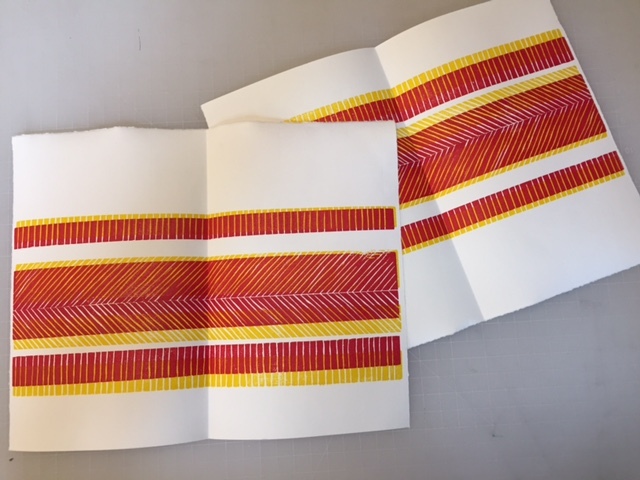 I am so pleased with the outcome of the embroidered paper doublures, it will most certainly be a technique I use again on a future binding. 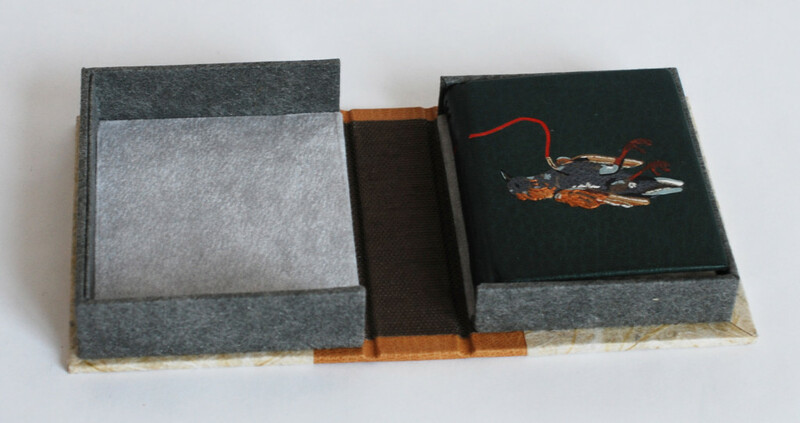 To see more images of the binding and it’s embroidered quarter leather clamshell box, click here. 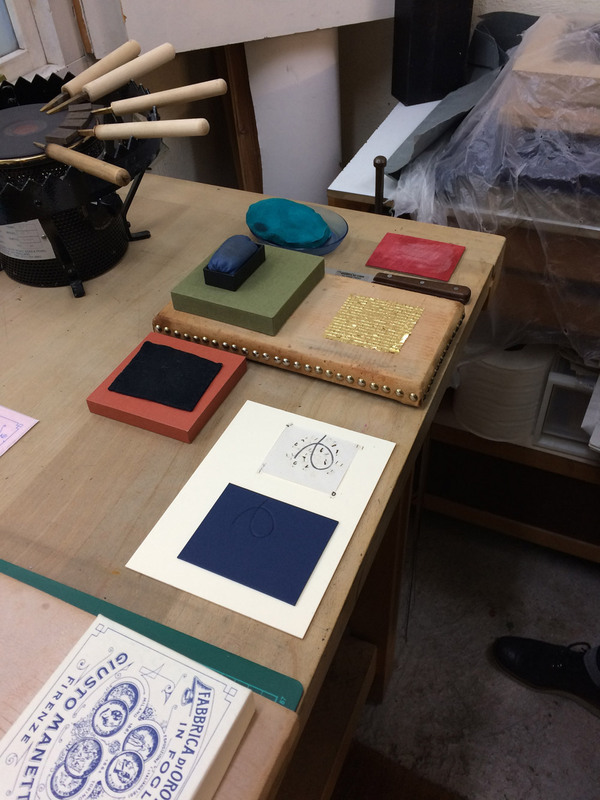 Over the first weekend in April, Third Year Studio hosted a workshop organized by the New England Chapter of the Guild of Book Workers. 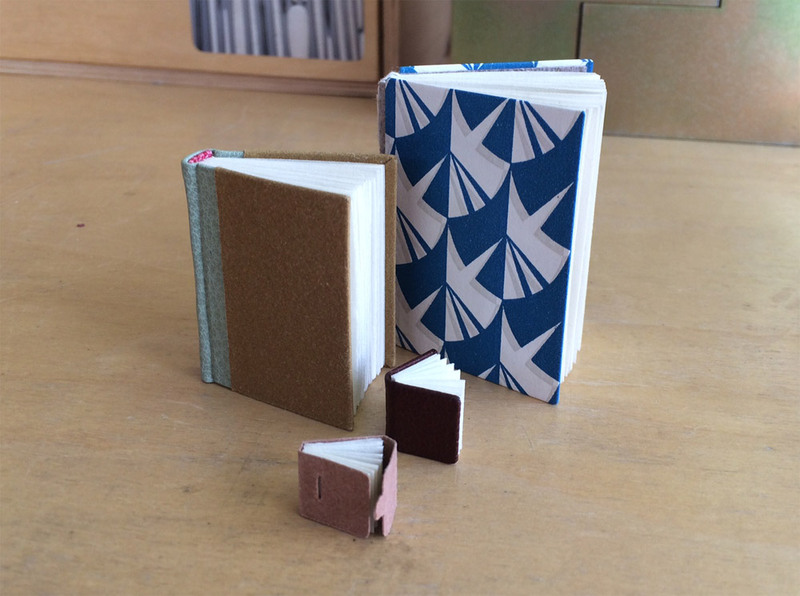 Third Year Studio is located in Boston and is run by Colin Urbina, who just so happens to be my friend and studio mate (Herringbone Bindery is run out of Third Year Studio). This was the first workshop we hosted and Colin was so gracious to opened his space to members of NEGBW and to our guest instructor Coleen Curry. 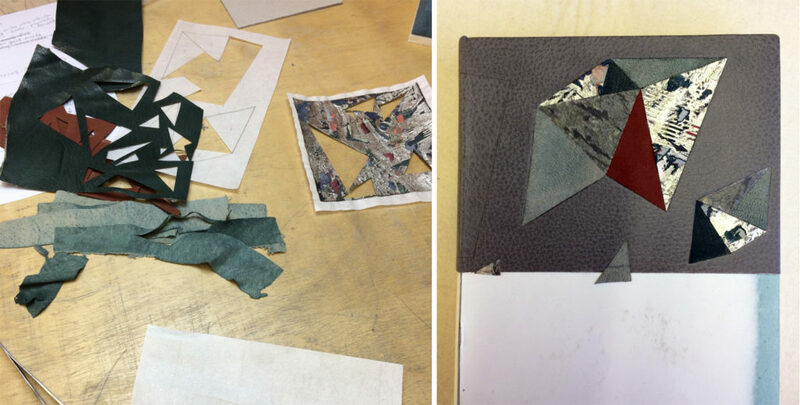 Coleen traveled to a unseasonably warm, then snowy Boston to teach 10 local New England binders, book artists and conservators Staple Binding in Stone Veneer. 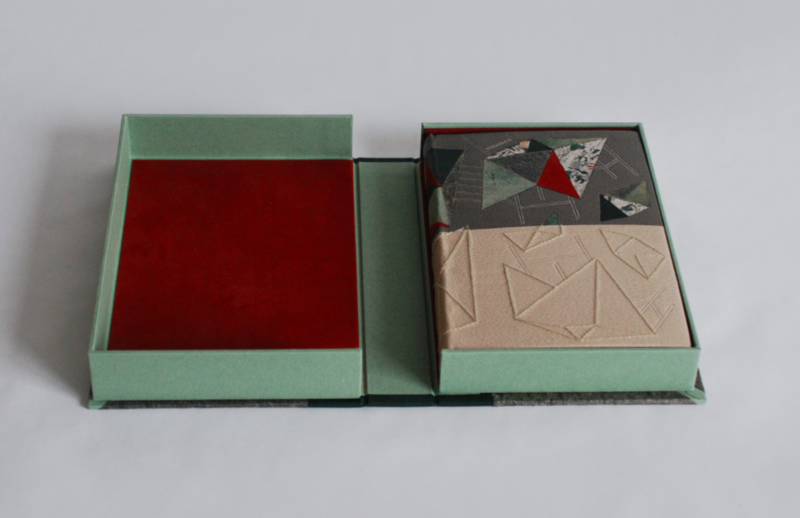 Coleen learned this innovative structure from Sün Evrard, who developed this binding as a conservation solution under the Tomorrow’s Past ideology. 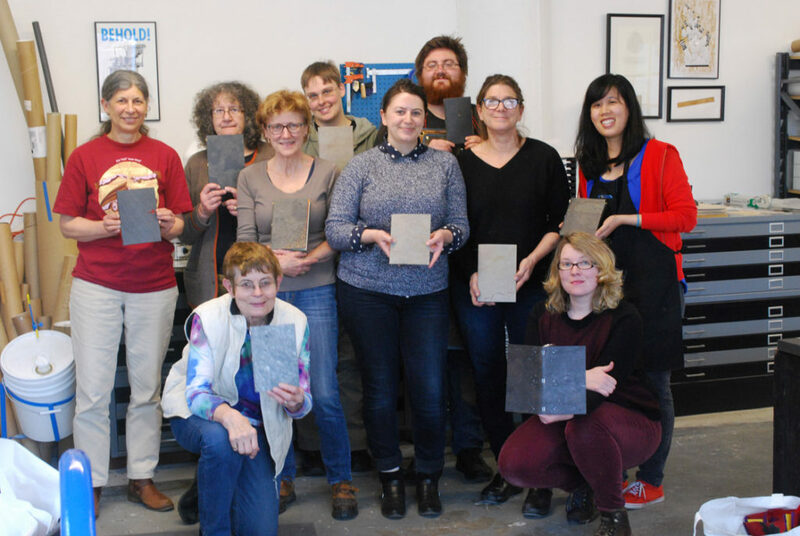 We began the first day of the workshop by handing around models of the Stone Veneer binding while introducing ourselves and learning about the structure and its history. The stone veneer comes from a place in Italy where it is cut to a veneer-thickness by use of lasers. This process puts an adhesive coating on the surface, while the back is coated with a cotton-fiberglass layer. 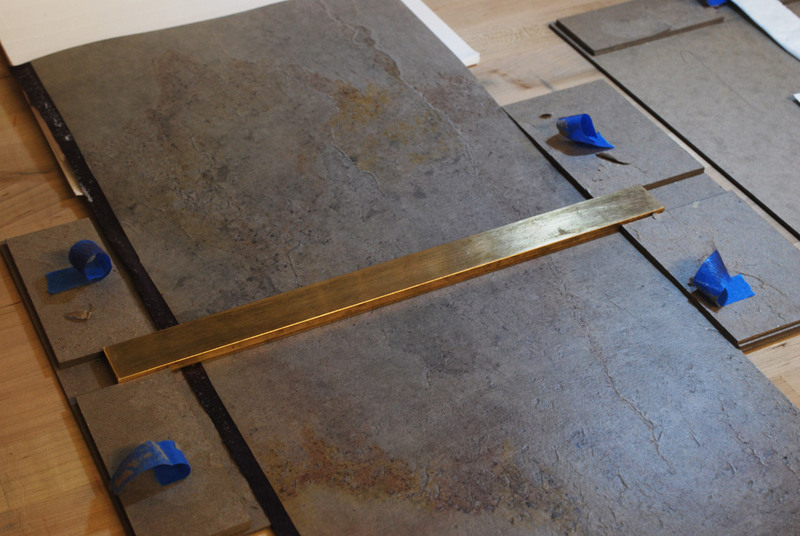 The veneer comes in two varieties: slate or quartzite. Yet within these two categories you can find a range of textures, patterns and tones. 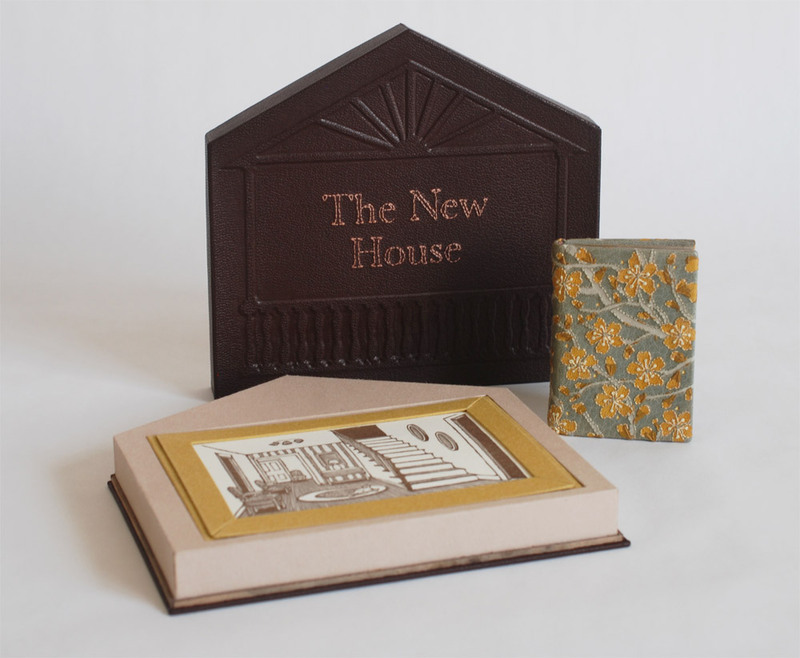 The decoration on the slate stone veneer binding of Toad Poems above was achieved by placing a gilt piece of paper behind a cut-out in the covers. The windows are aligned with the staples, an example of how to incorporate the layout of the staples with the overall design. The details of the binding above are of the blank model that Coleen made during the workshop with Sün, where she learned this structure. The covers were decorated using a Japanese screw punch. The circular cut-outs were backed with various colored Japanese tissues, offering a small pop of color against the grey slate. The image on the left shows part of the interior construction. 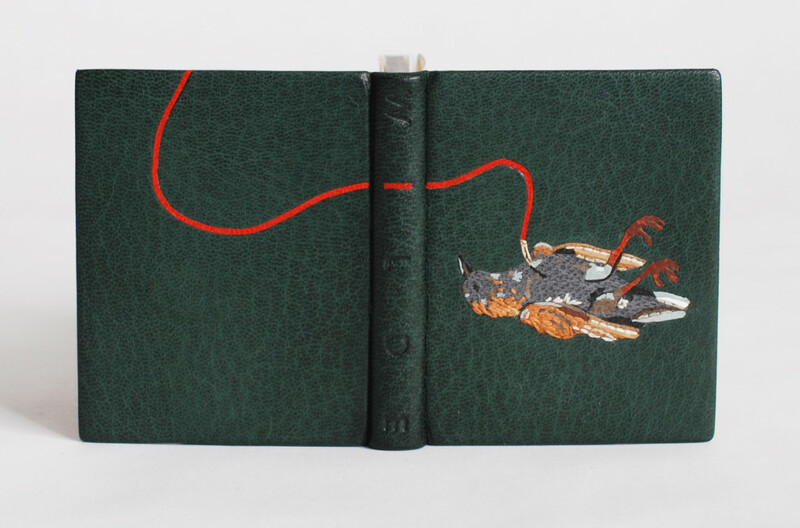 Another example binding that Coleen shared with us, is this binding of Jabberwocky by Lewis Carroll. It was a great example of how well the stone tools and how it can handle embroidered decorations. 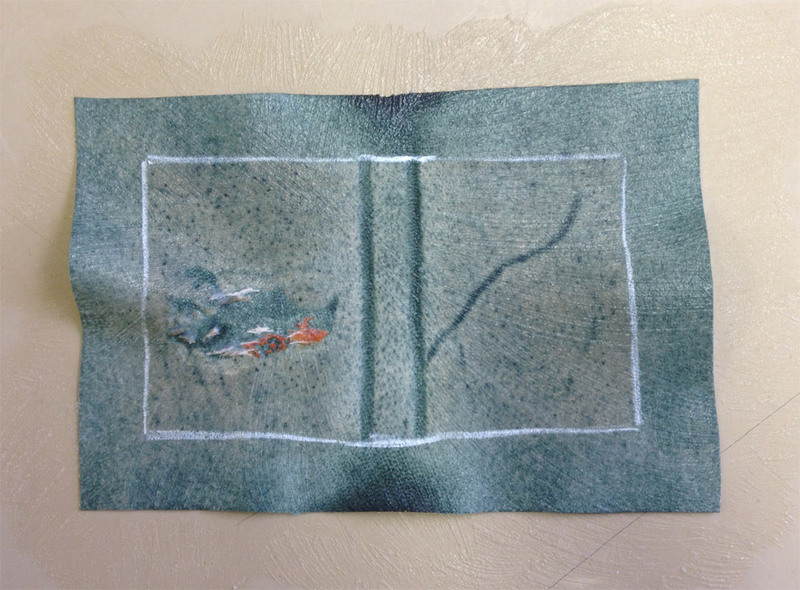 I especially loved the playfulness of the patched endpapers and use of embroidery to mend the edges. After looking through Coleen’s examples, it was time for us to make our own model. After choosing our unique piece of stone (I chose a lovely light colored slate with splashes of yellows, pinks and purples), we were instructed to stamp a series of parallel lines into the center (or spine) of the stone. We did this by strapping our stone and a heated brass rule into a contraption and keeping it under the weight inside our large press. 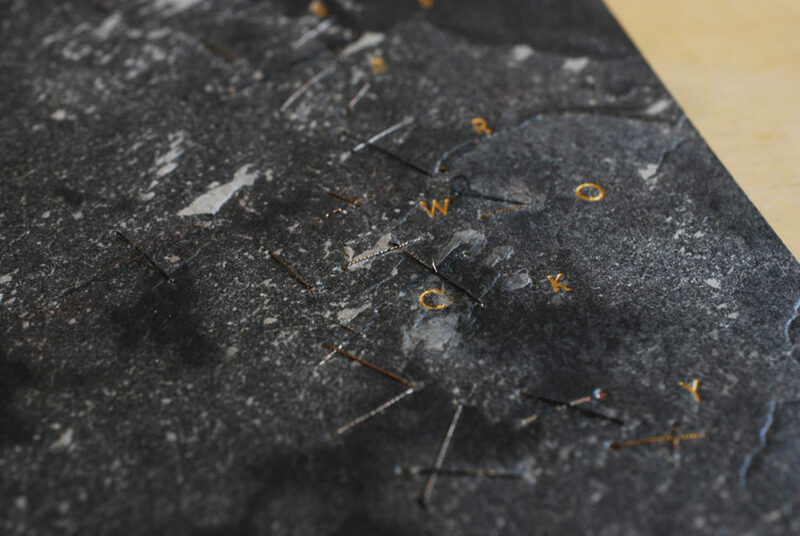 Afterward, we laminated a second layer of Japanese tissue to the backside of the stone. While that was put to bed, we laminated together pieces of colored Japanese tissue that would ultimately become our endpapers. While our stone continued to dry, we trimmed down our endpapers to either match our text block or extend slightly behind the edges. 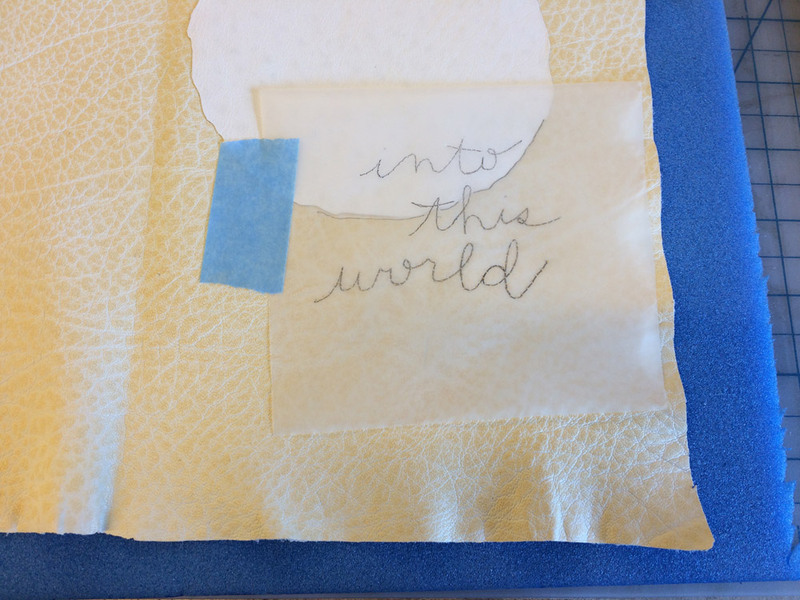 The image below shows Coleen demoing the pamphlet stitch that we would use on the text block. 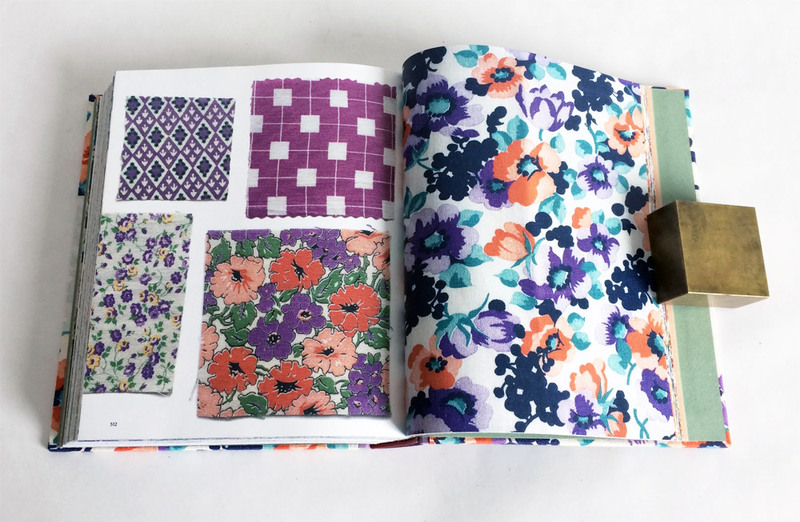 The image on the right shows how I trimmed my endpapers. 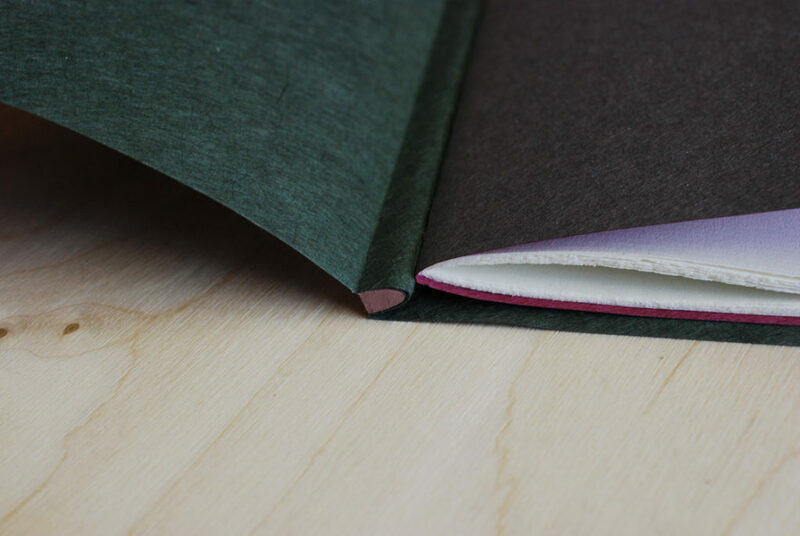 In the end I didn’t like how much of a square I gave the outer (green) endpaper. With the additional square from the stone, the overall square became to large for the size of the text block. At the end of day one, Coleen shared with us two fine bindings on loan from a local collector. It was an unexpected and delightful treat to handle and speak with Coleen about her bindings and decorative techniques. On day two of the workshop, we were all reunited with our backed stone veneer. We went through the unnerving task of stamping our veneer with the brass rule three more times to redefine the lines and make sure we had an even amount on the outside and odd number on the inside. It was very important to register the brass rule correctly each time, so that our lines stayed crisp and parallel to one another. 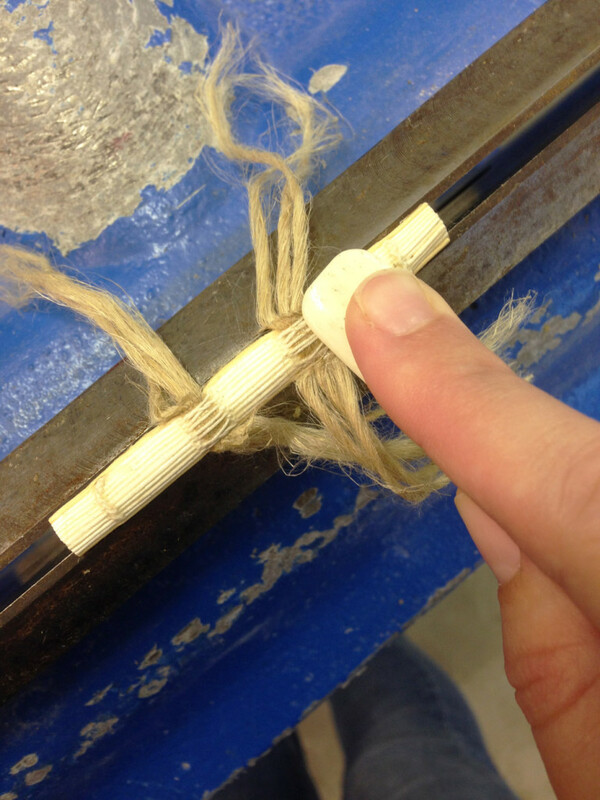 I snapped a photograph at the very end when I was ready to take the brass rule and stone out of our jig. 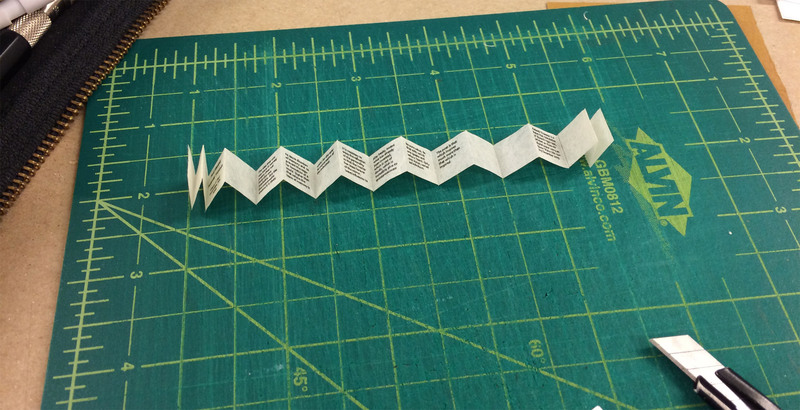 We also advanced on the text block by attaching the wooden spine stub piece. This stub could be made from a number of materials, but we choose from a selection of basswood pieces that were cut down and laminated to match the height of the outer endpaper and thickness of the text block. The wooden piece was also shaped to match the roundness of the folded signature. I painted the ends of my spine piece to offer a bit of decoration to the head and tail. 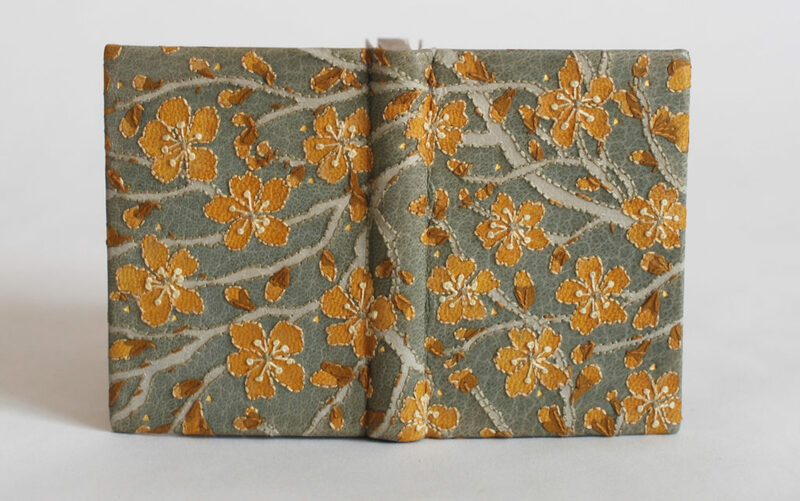 After trimming, shaping and painting, the spine piece was affixed to the outer endpaper and the fore edge was finally trimmed to the final width. At this point, we were ready to attach our text block to the stone veneer. The first steps were to create a punching jig to guide our awls to punch holes in the folds of the outer endpaper and in the stone cover. The stone was easy to pierce, once you felt it was in the right place, I simply used an awl to poke through the stone. 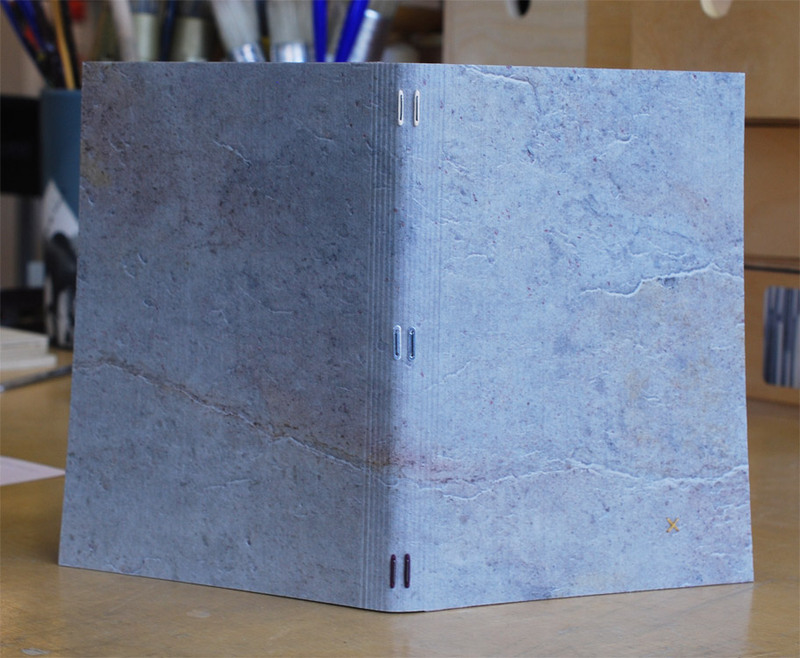 We laced our text block temporarily into the stone covers in order to fold the fore edge and trim off any excess. 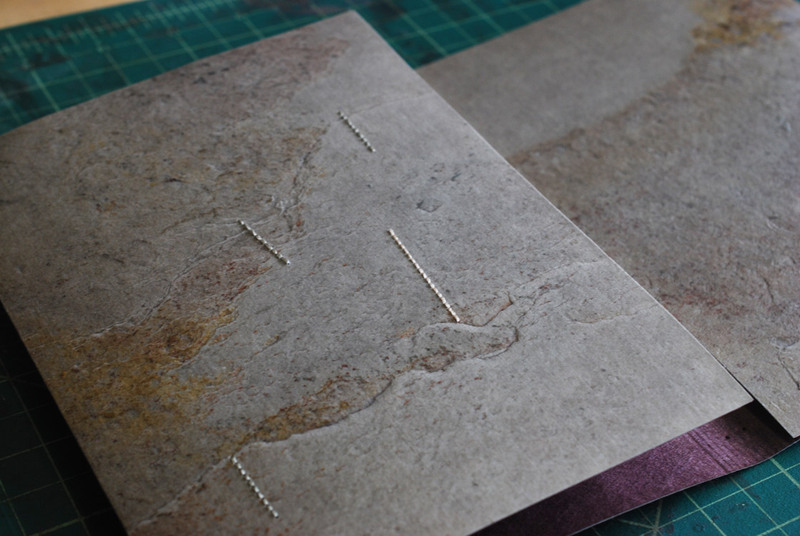 Before laminating the folded stone onto itself, you have the opportunity to add any decorative elements such as cut-outs, sewing, tooling, etc. Due to time constraints (I had to remake a painted wooden stay that I dropped on the floor), I chose to add some simple embroidered stitches just to see how well I could sew through the stone. This was mostly done on the inside of the front cover. 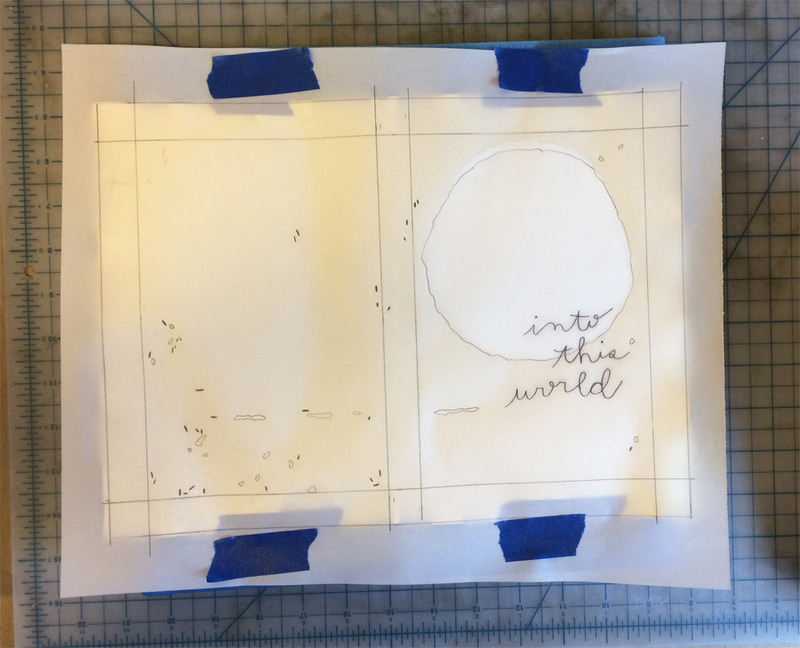 With a pile of stays (wooden, metal and vellum) and metal staples in hand, I was ready to securely attach the text block to the stone veneer covers. In the image on the right below, Coleen is demonstrating how to use plastic tubing to make it easier to insert the staples and stays. 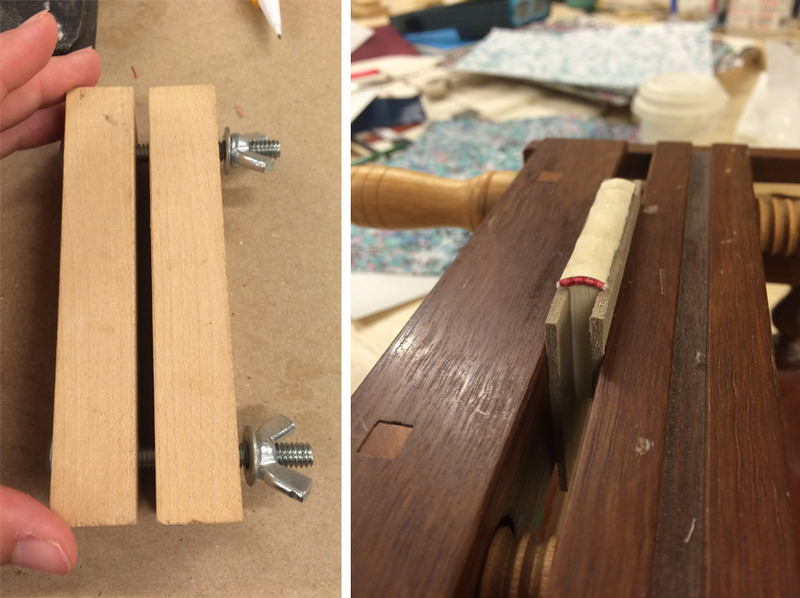 For my binding, I chose to use both metal connectors and wooden stays. I painted one set of wooden stays to match the dark purple laminated to the backside of my stone. 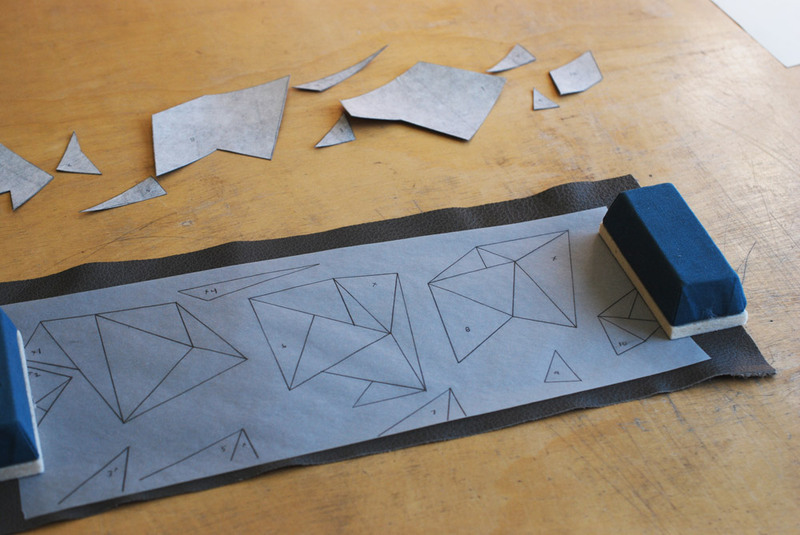 The staple is inserted through the stay and the vellum catches the legs of the staples on the inside of the endpaper. We stuck an orange stick into a piece of cork, this strange looking tool (seen above) aided in folding over the legs of staples. And viola! The binding is complete. At this point I could still add tooling, but I loved the look of my stone, that I chose to leave it untouched. We had a great workshop with Coleen, she brought so much experience and knowledge to the workshop. 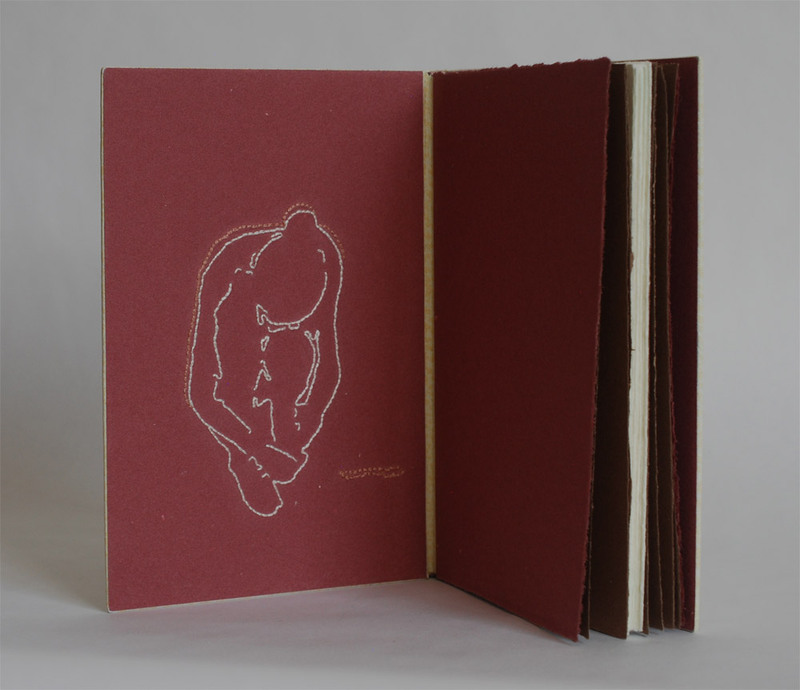 Her patience and persistence ensured that everyone walked away satisfied and with a finished binding. 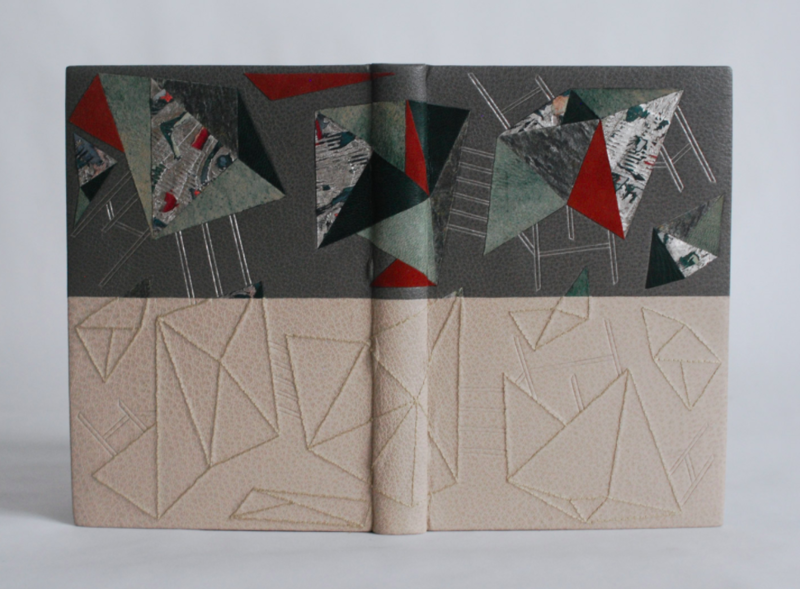 This binding was featured very briefly on the blog last year in my review of the North Bennet Street School’s 2015 Student and Alumni Show. 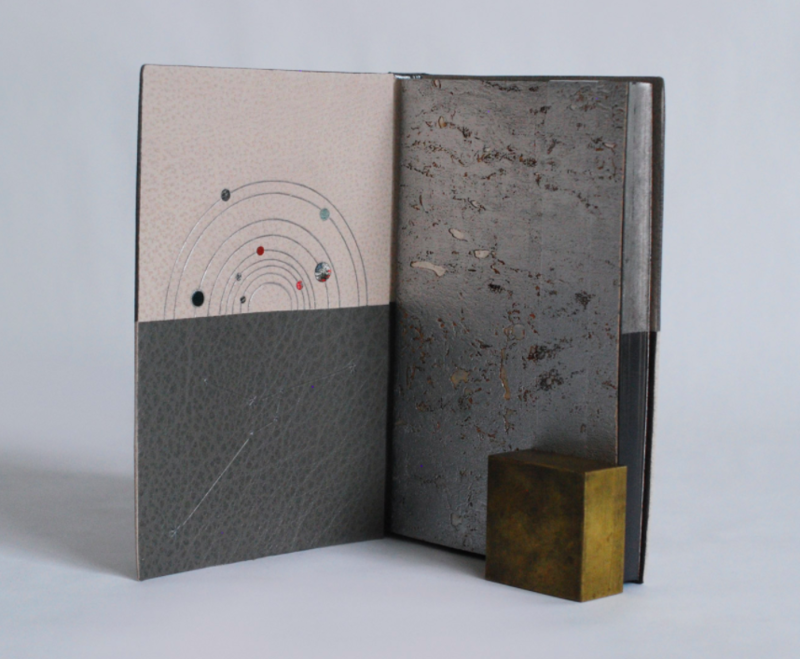 After the show, I sent it off to England for the Society of Bookbinder’s International Competition. 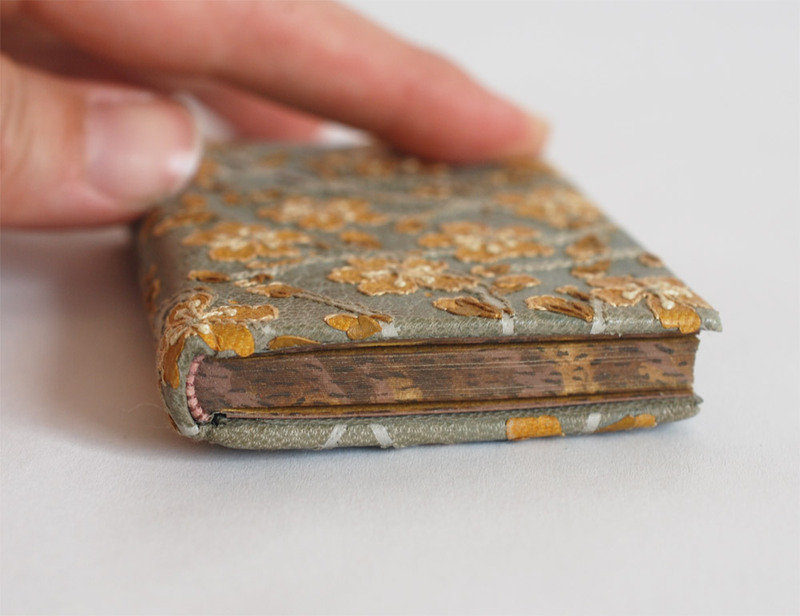 Just last week, I was finally reunited with this macabre little binding. Its presence on my bench reminded me that this binding needed a proper post documenting the steps involved in its creation. 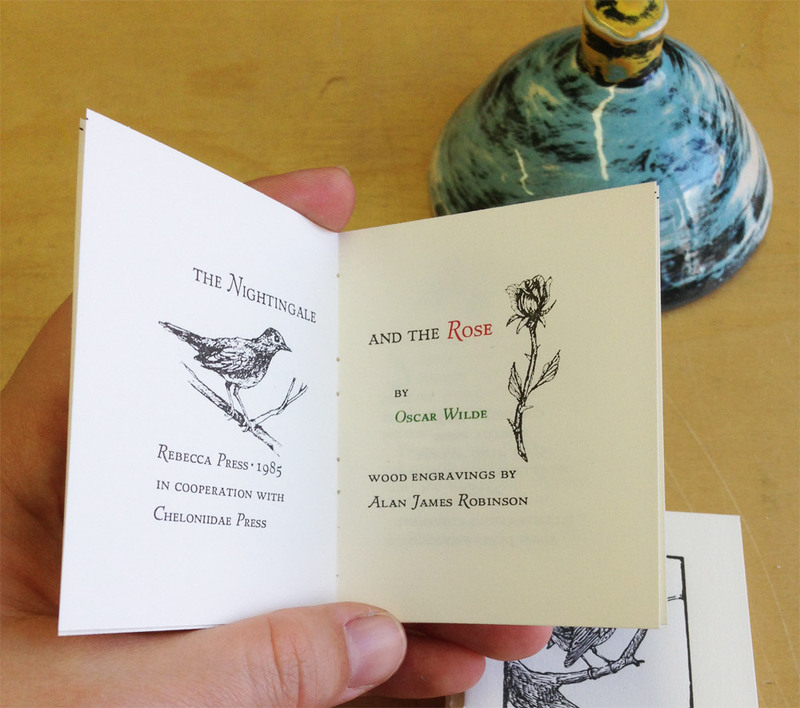 This edition of Oscar Wilde’s The Nightingale and the Rose was printed by Rebecca Press in 1985 and includes wood engravings by Alan James Robinson of Cheloniidae Press. My design for both the nightingale and the rose are drawn straight from Robinson’s engravings. 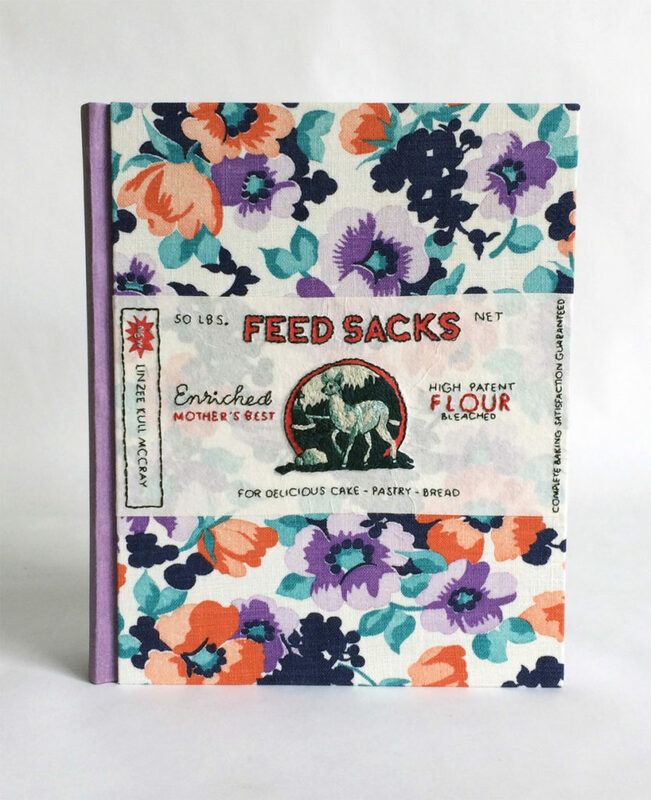 The text block was sewn on two flattened cords and rounded and backed in a job backer. 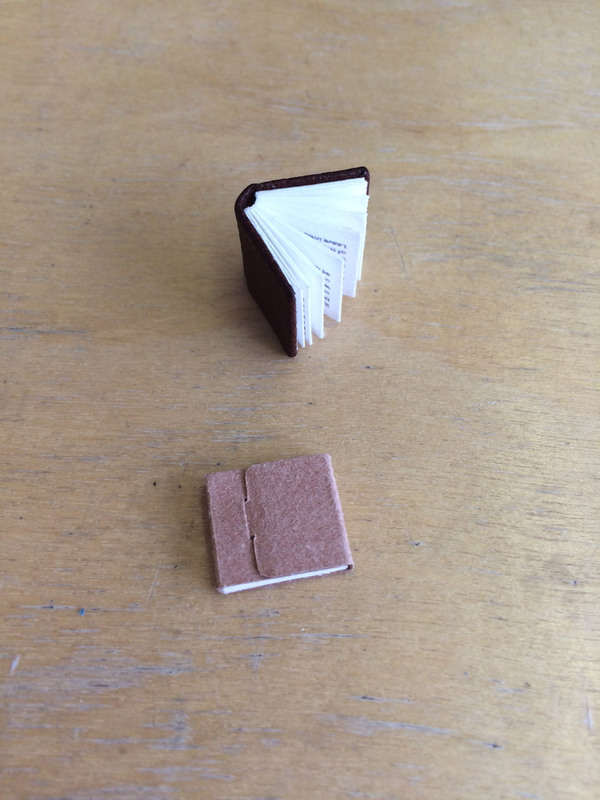 Which was a bit excessive for such a tiny binding, but offered me a bit a humor. In lieu of a backing hammer, I used the flat, rounded side of my bone folder to achieve the rounded shape of the spine. Once the forwarding on the book was complete, I could focus on the design. I photocopied the image of the nightingale and rose from the text; enlarging them to the desired size. These photocopies became my guide for drawing out each shape of the bird and flower. Beginning with the bird, the first onlays attached to the base leather were a silhouette of the body, the beak and feet. 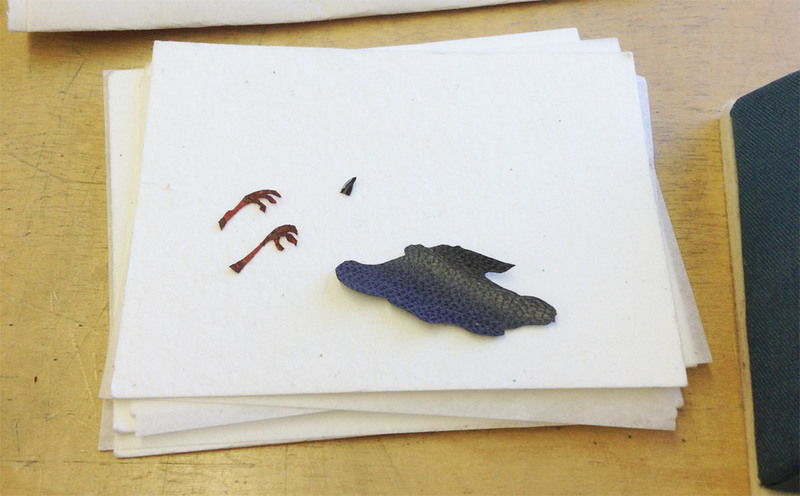 In order to get some depth and texture to the bird’s feet, before cutting out the two shapes I laid feathered onlays of maroon goatskin over thinned out terracotta goatskin. 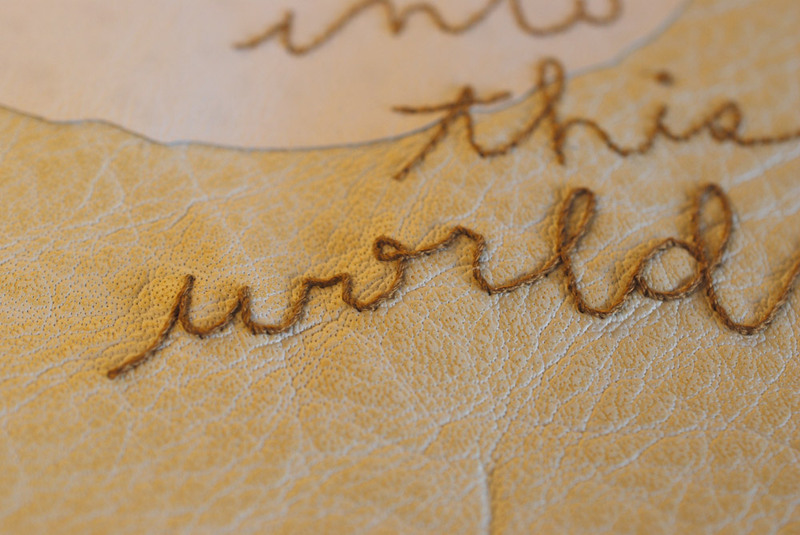 After paring the leather, I was free to begin with the embroidery. When I embarked on this task, I had very loose plans and approached it in a very free form way. 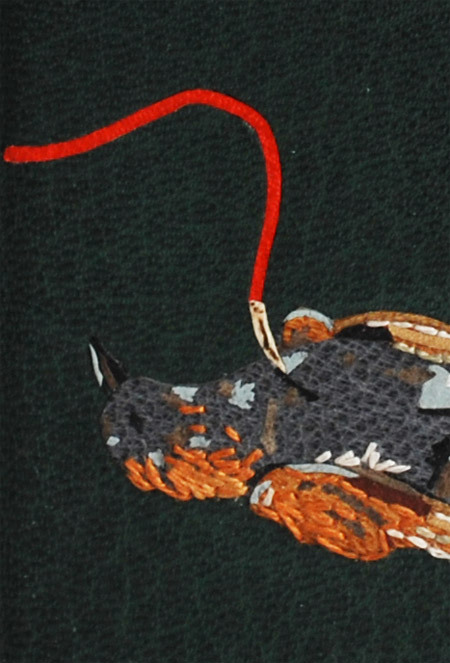 I would build up the image with embroidery and then switch to adding feathered onlays, then more embroidery until I felt satisfied with the look of the bird. You can see this progression below (please forgive the poor photography and variation in color). 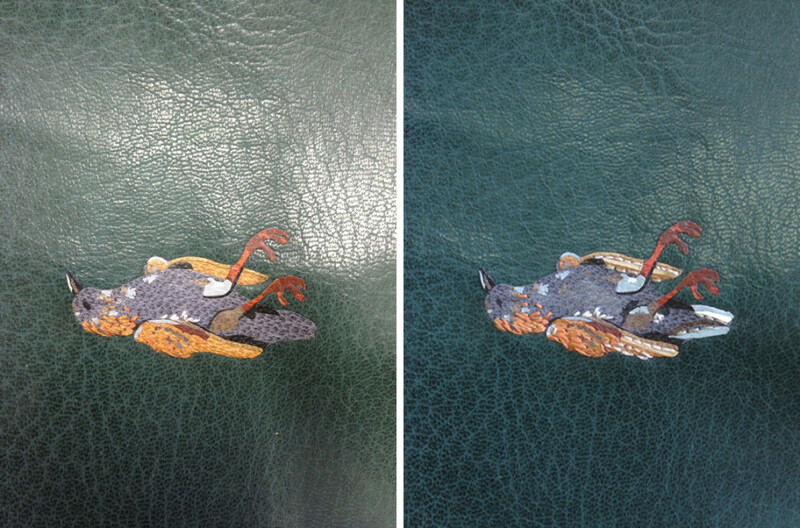 With the design of the bird fully assembled and embroidered, I prepped for covering. After pasting out the leather, I laid down any stray tails from the embroidery beside a stitch to hide its appearance from the front. Then I progressed with the covering, formed the endcaps, wrapped the turn-ins around the cover boards and pleated the corners. 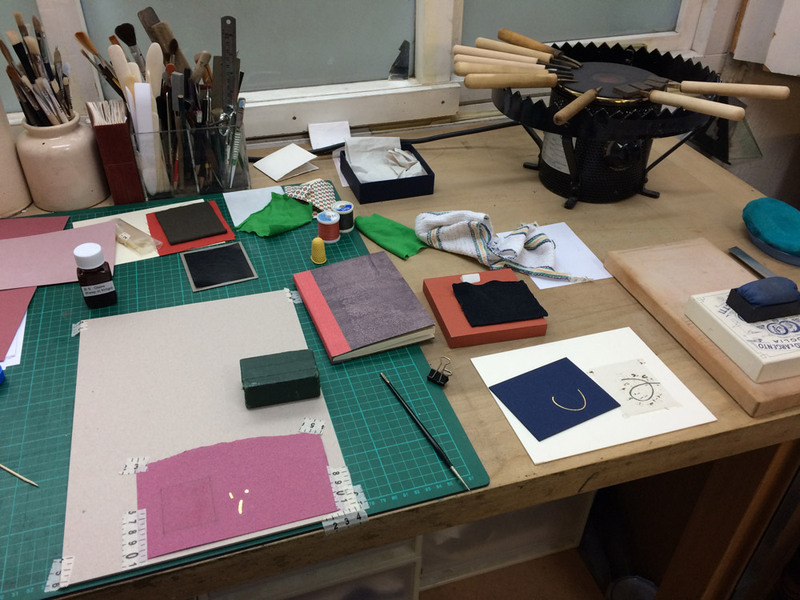 After setting the boards, I put the book to rest between a small scrap of felt in my small wooden press. 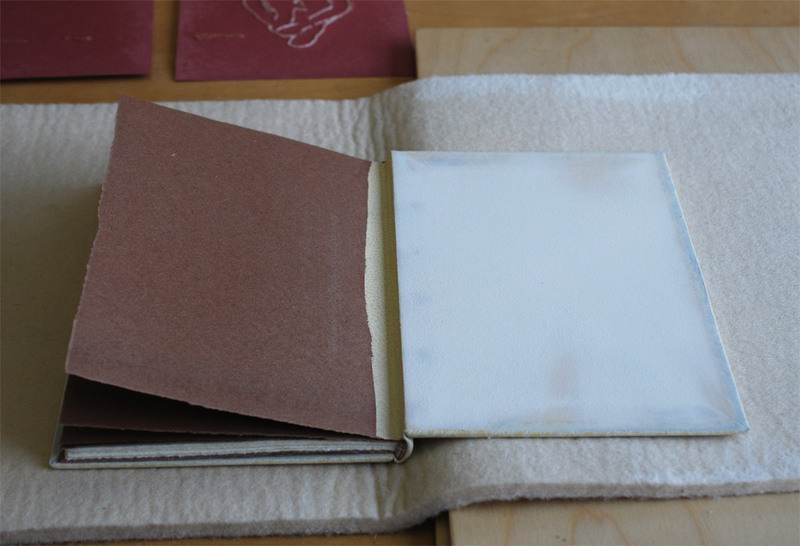 Once the book had dried, I carefully opened each cover and began the steps to prep the inside for the leather doublures. The back doublure was embellished with a multi-onlay and embroidered rose. The steps involved in creating the rose mimic those used to create the bird. The tricky part here happened while back-paring. It was impossible to pare to the desire thickness for doublures without slicing through the rose onlay. So the rose is not a true back-pared onlay, it actually sits on the surface of the leather. I was worried this extra thickness might impact the neighboring flyleaf or the way the book closed, but neither became an issue. The Nightingale and the Rose is a tale about a nightingale who chooses to give her life so that a young man may find love. By piercing her breast into the thorn of a rose, her blood stains a white rose red. 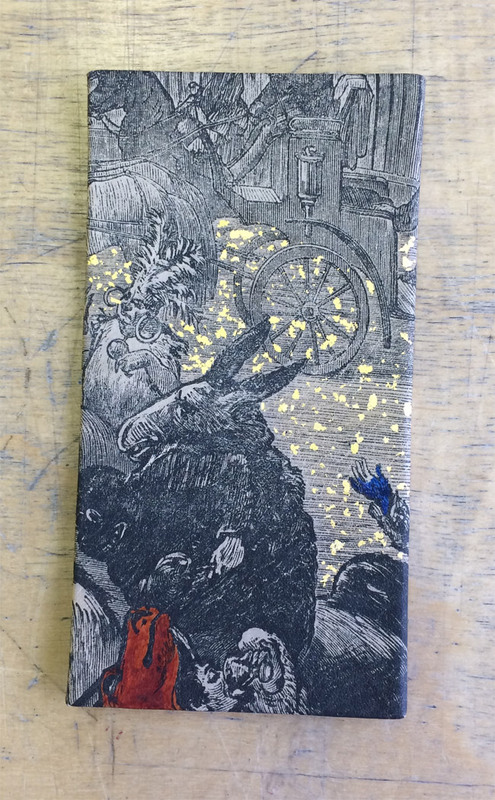 This part of the story is illustrated with a tiny wood veneer inlaid “thorn”. 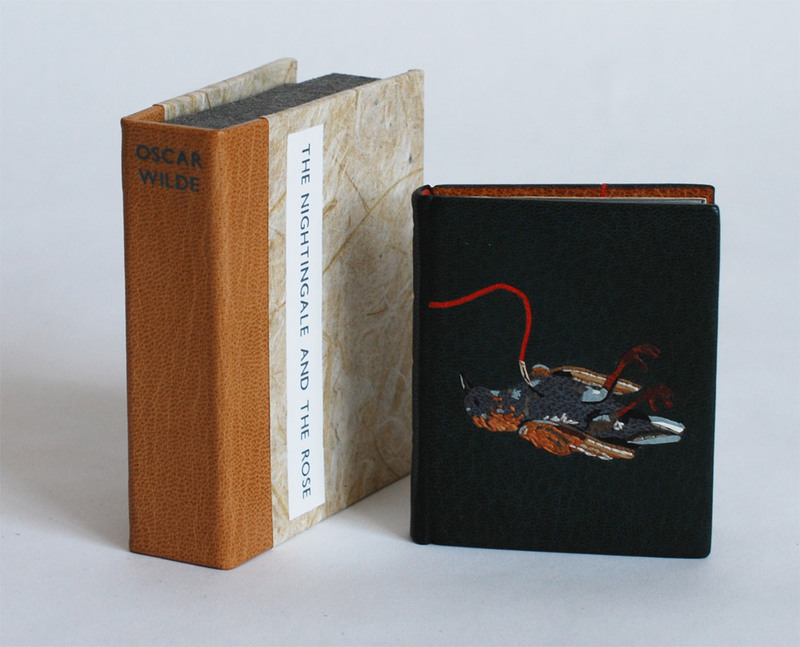 The red goatskin Ascona onlay runs from the top of the thorn across the spine (at the “I” in Wilde) and to the rose on the back doublure. 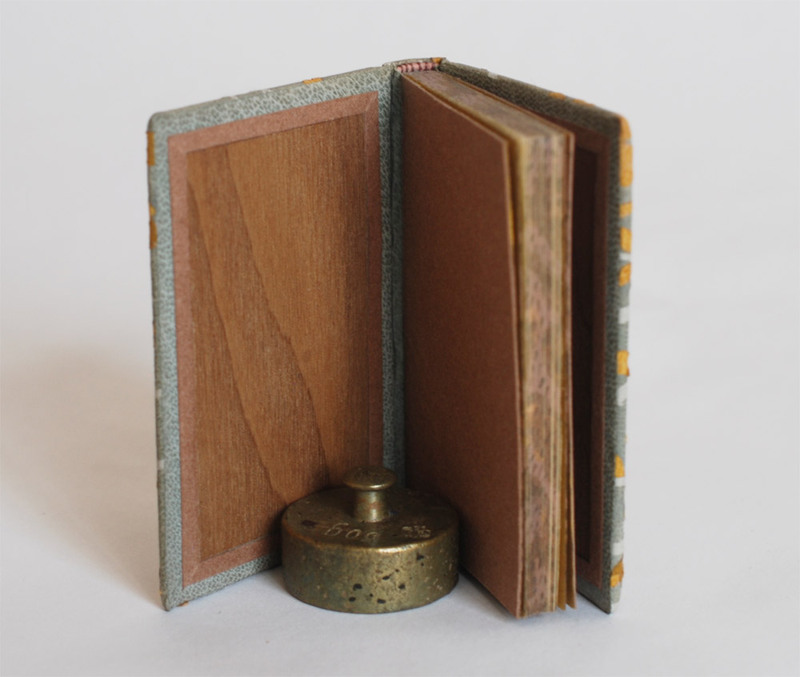 The book is housed in a miniature quarter leather clamshell box. 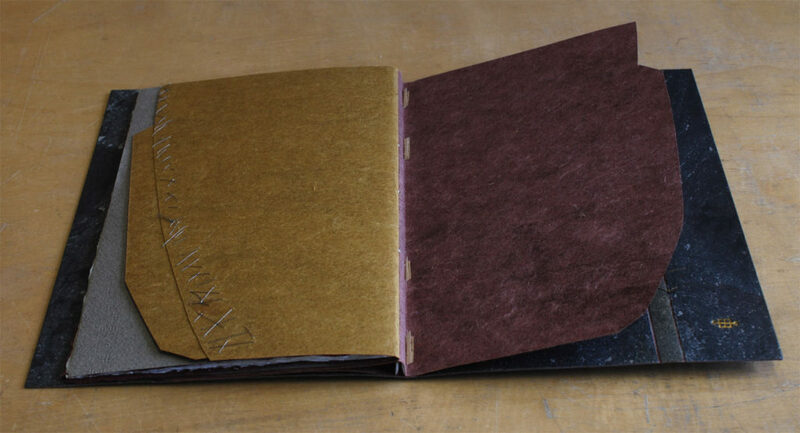 I used the same tan goatskin on the spine of the box which was used on the doublures. 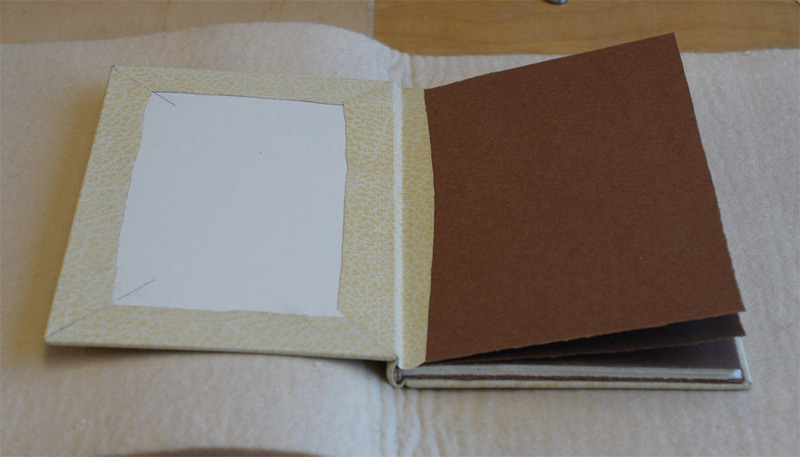 The rest of the case is covered in a paper I made using cotton and leek skins, also used for the flyleaves in the binding. 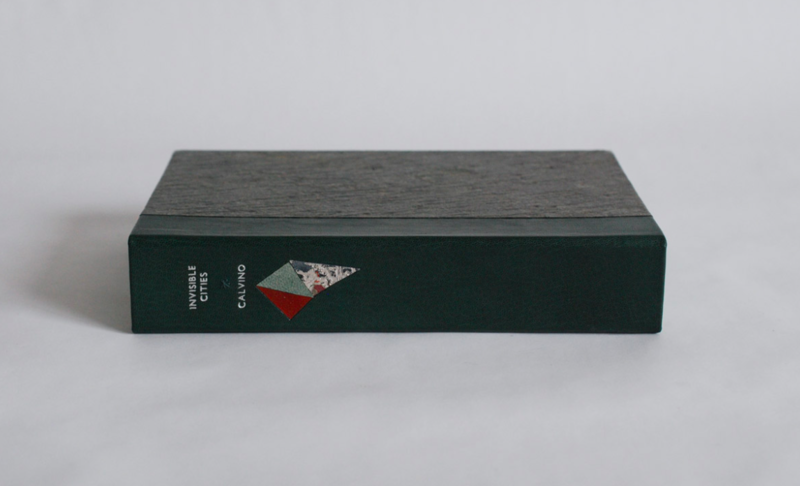 The author name is stamped in matte grey foil on the spine and the title is stamped on a Mohawk label that sits in a recessed well. The trays are covered in granite colored Cave Paper. 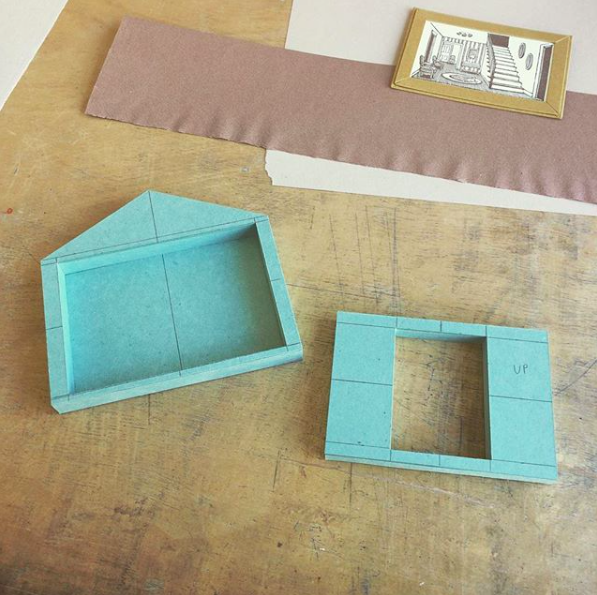 The trays are lined with a light grey Silsuede fabric. 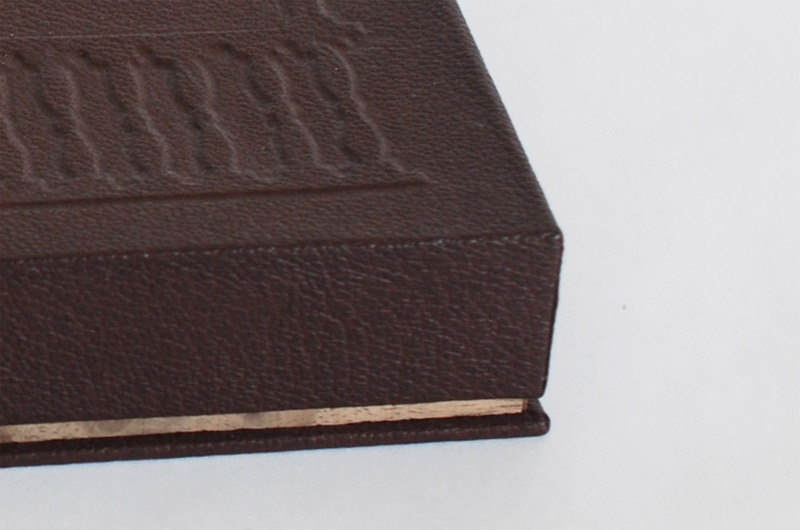 I prefer using a faux suede to line boxes for embroidered books and veneer bindings, I think it offers a bit more cushion and less chance of wear on the binding. 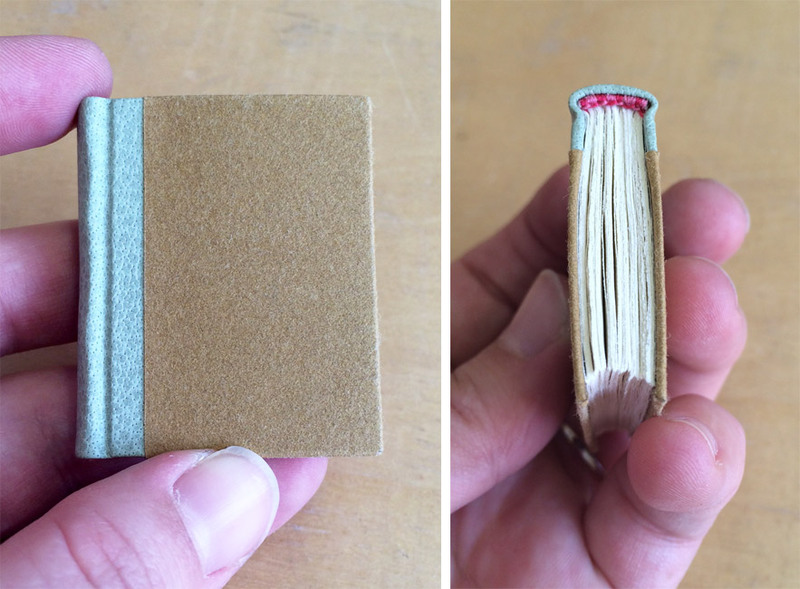 I’m really proud of this little binding. My embroidered work is definitely evolving and I like the direction it took with The Nightingale and the Rose. I have a few fine bindings lined up to complete this year and I look forward to sharing their designs and techniques with you.